We are proud of how hard our students worked on the eMPowerME test this year. Each student earned tickets for focus and engagement while they tested. Today, they use those tickets to buy food, prizes and t-shirts. 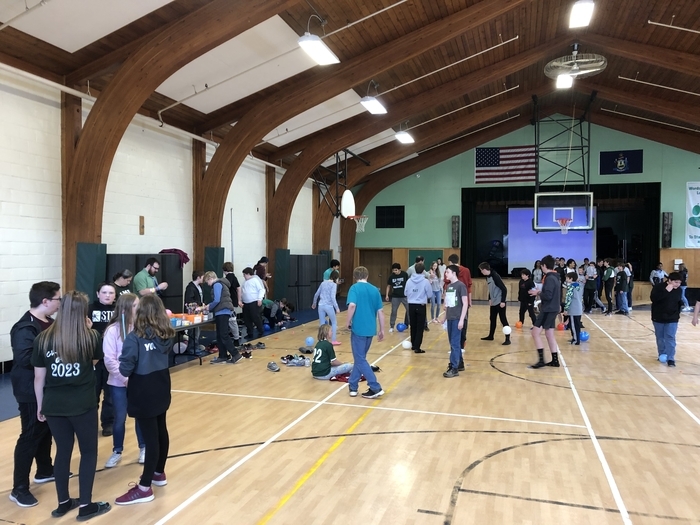 There are games everywhere and the eMPowerME Fest is in full swing. We are proud of our students. The LMS Civil Rights Team is hosting a reverse bottle drive April 22-May 10. Bring your bottles to LMS and give them to a civil rights team member or Ms. Henry or Mrs. O’Connell. We will be adding to our account at Mahan’s to raise money for our state conference and other needs. If you want to take your bottle directly to Mahan’s just say “ Put my bottles on the LMS Civil Rigths Team Account!!!! Thanks in advance. 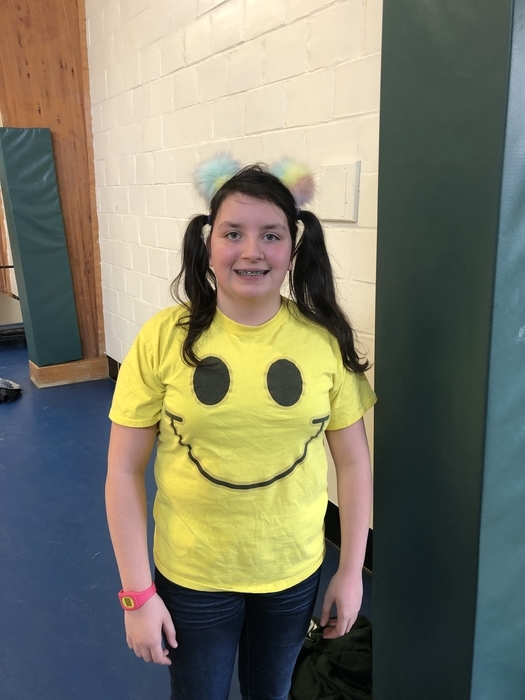 This week is spirit week and today was Wacky Wednesday! 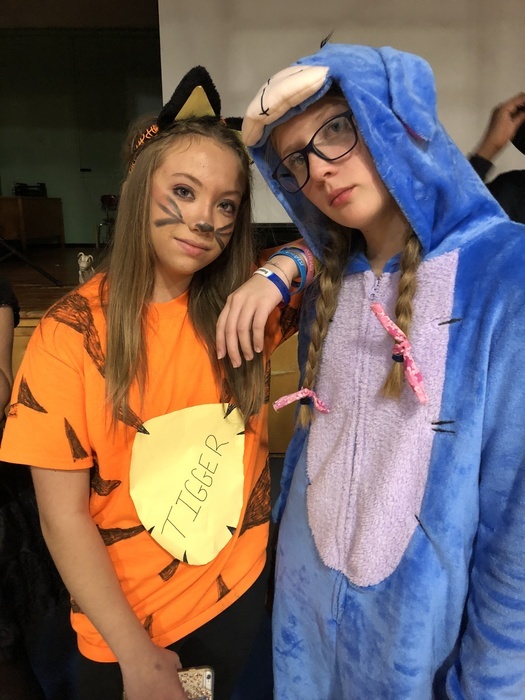 Tomorrow is Character Day and Friday is wear school colors day. Planning for our 8th grade class trip to Camp Jordan is well underway. 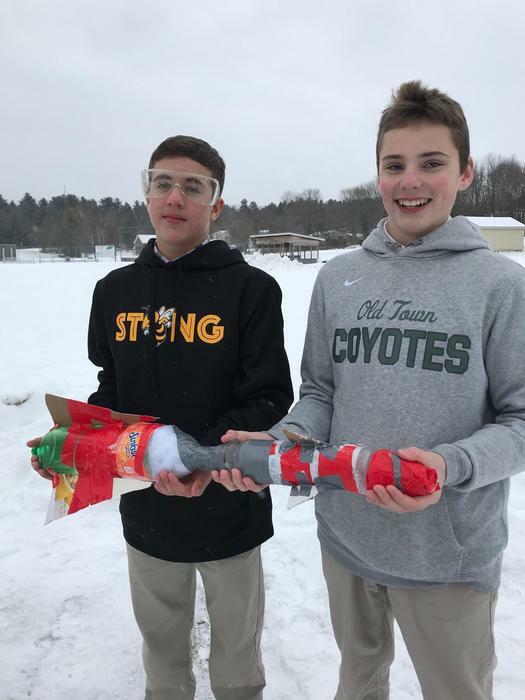 We ask that parents/guardians of 8th grade students follow this link (https://5il.co/74wy) to read about how they can be involved with the trip and to sign up for a volunteer role. We have dozens of jobs that need to be filled in order to pull off the trip. Thank you in advance for your support of this great opportunity for our students. 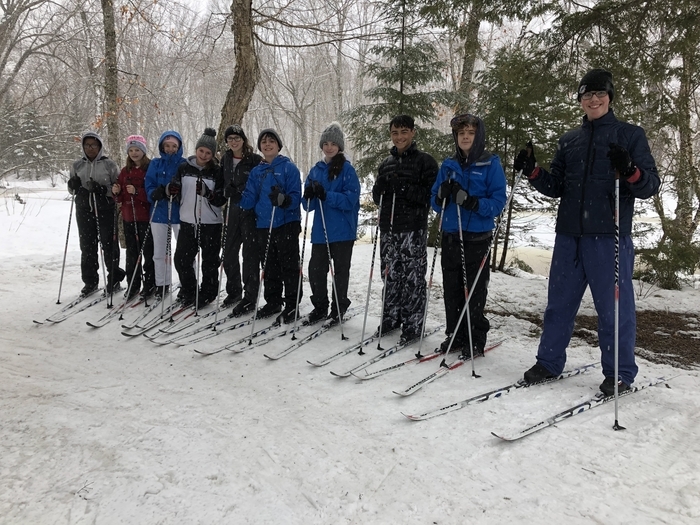 The 8th grade Cathedral Team went skiing with MOEP today and had a blast. 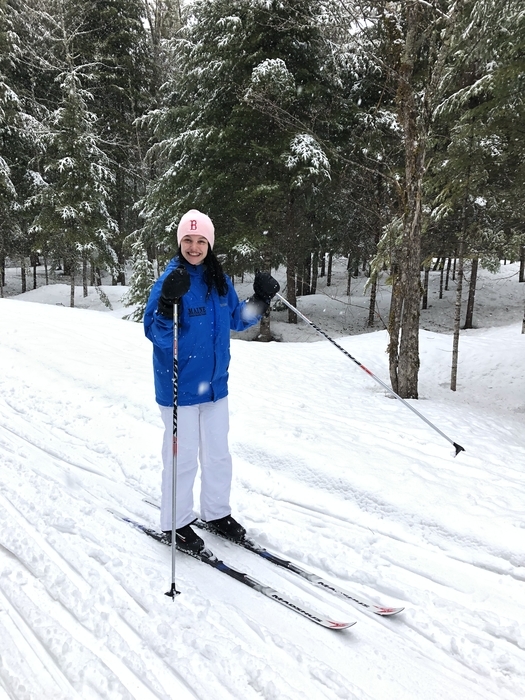 We had several first time skiers and the positive vibes and encouragement were everywhere as students cheered on their peers. 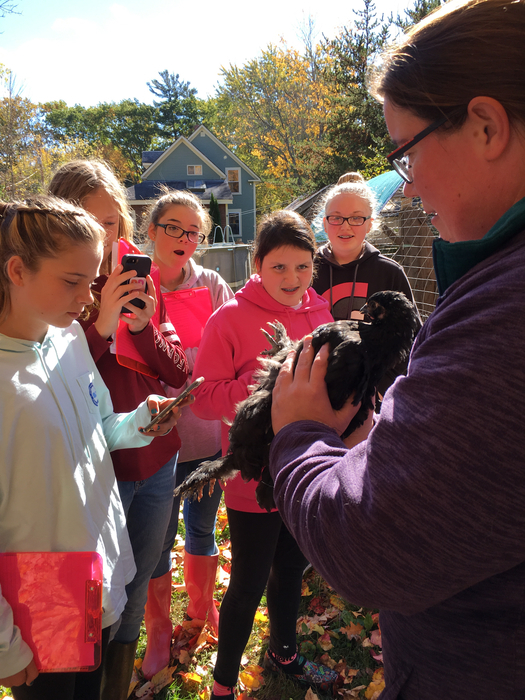 The sense of community was palpable and we couldn’t be more proud of how our students represented Leonard Middle School while on the trip. 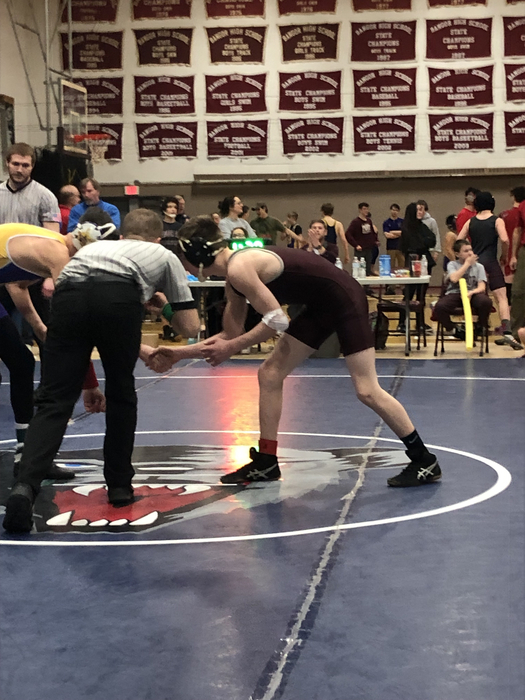 Xander Doty was at Portland for the Marshwoods New England wrestling tournament 3/30/2019 and took first. He is the New England champion. Won all four rounds and brought the trophy home. 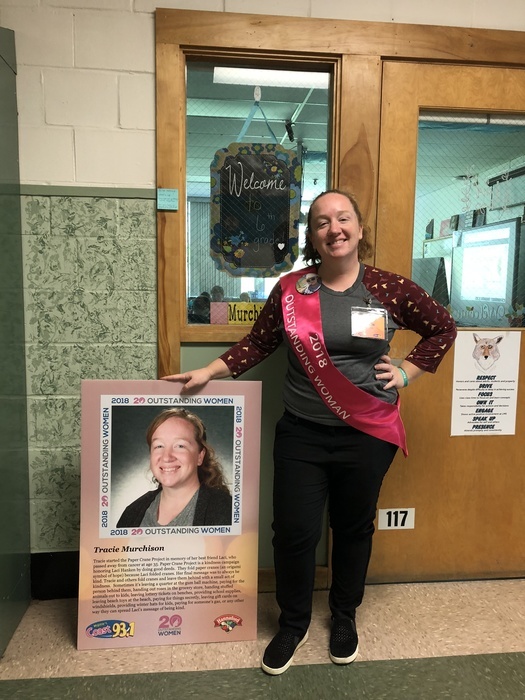 We are so proud of our champion! 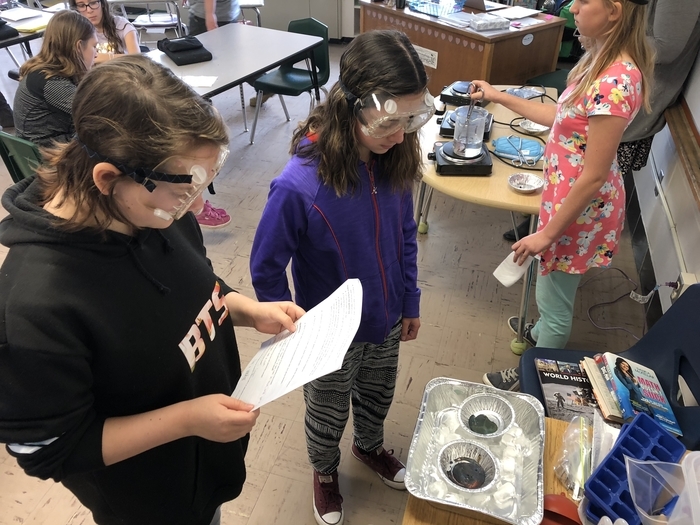 Yesterday, LMS students wrapped up their last day of regularly scheduled State testing. We are very proud of the effort our students put into a rigorous three days of challenging tests. 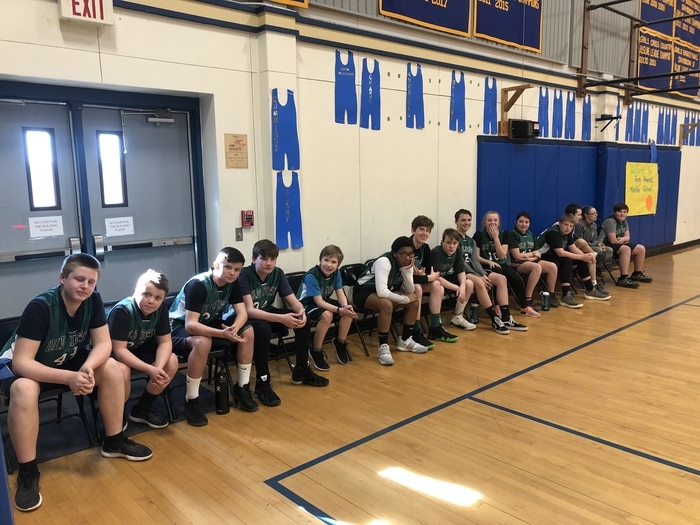 The LMS Unified Basketball Team concluded their season last night down in Belfast! All 3 schools made a great showing. So proud of these student athletes who did a great job representing our school and community! Way to go Coyotes! 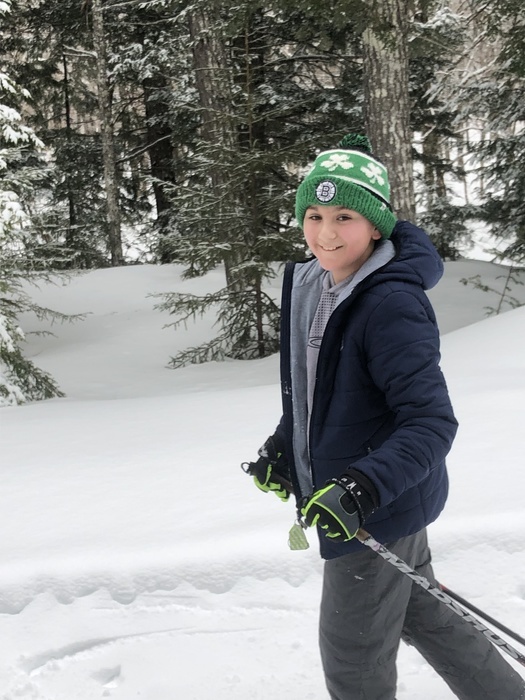 8th Grade Cathedral Team will not be going skiing this Friday, as planned. It’s supposed to be pouring rain. We have rescheduled to Wednesday, April 3—leaving at 8:40 and returning by 2:30. River Runners will be going on their trip, as planned. 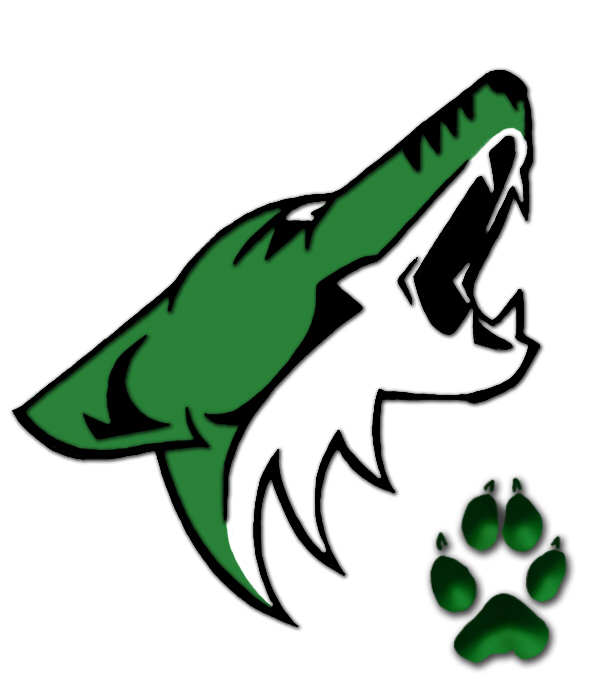 Old Town High School will host student registration tonight at 6PM. L.M.S. Math Team will meet this Wed. (3/20) from 2:45-3:45 in Mr. Schlaefer's room (124). Hope to see you all there. 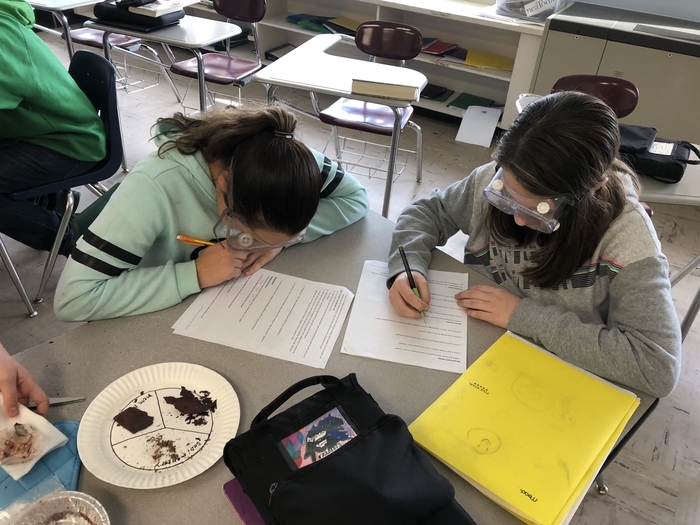 We will do some practice problems and plan for our trip to Eastern Maine Community College on Tuesday, April 30th. Snacks will be provided! 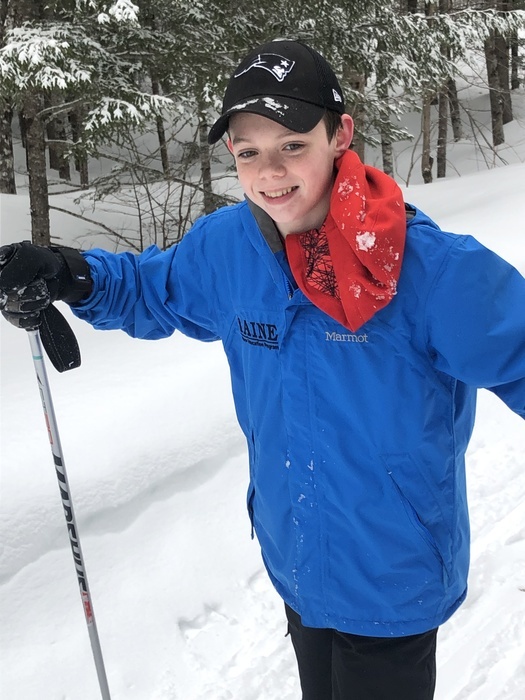 Teddy S. qualified for the Maine GeoBee and has been invited to UMF to compete at the State level. Go Teddy! eMPowerME State testing begins tomorrow. Please make sure that your student is well rested and fueled up with a good breakfast as they come into school each morning. As much as possible, please limit absences and dismissals for the rest of this week. If you know in advance of a dismissal, please communicate that with your student's advisor. 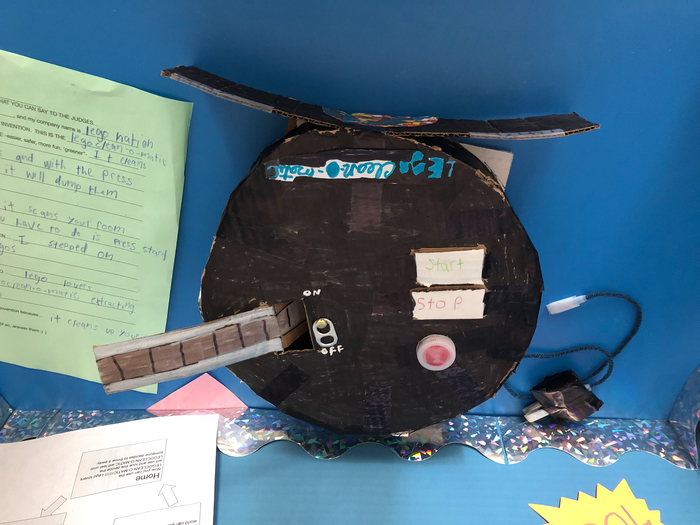 We are so proud of our LMS Inventors! 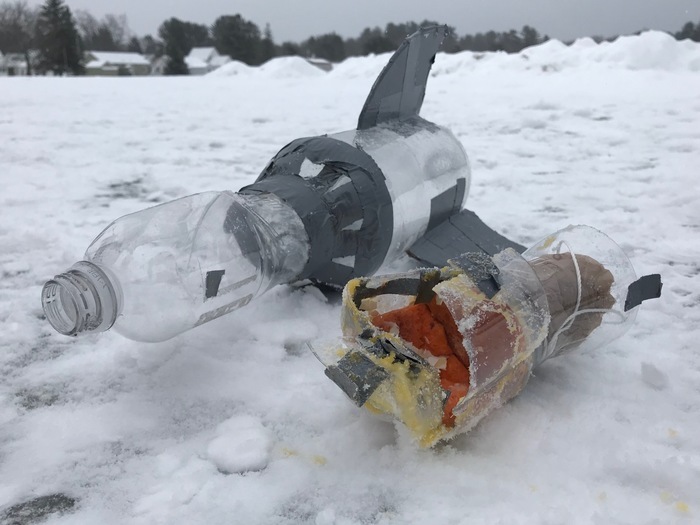 Old Town represented well at the Maine State Invention Convention on Saturday. 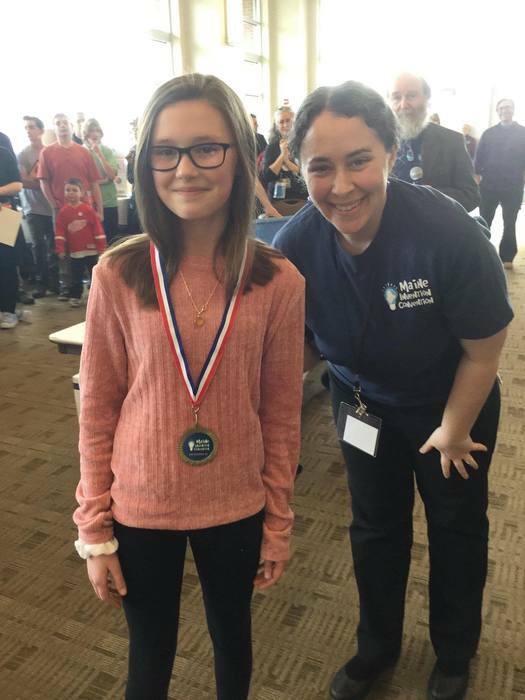 Zoe Yerxa placed 3rd in the 7th Grade Division and Brendan Mahaney placed 1st in the 7th Grade Division. Way to go Coyotes! BAW as a team finished 3rd out of 15 teams. 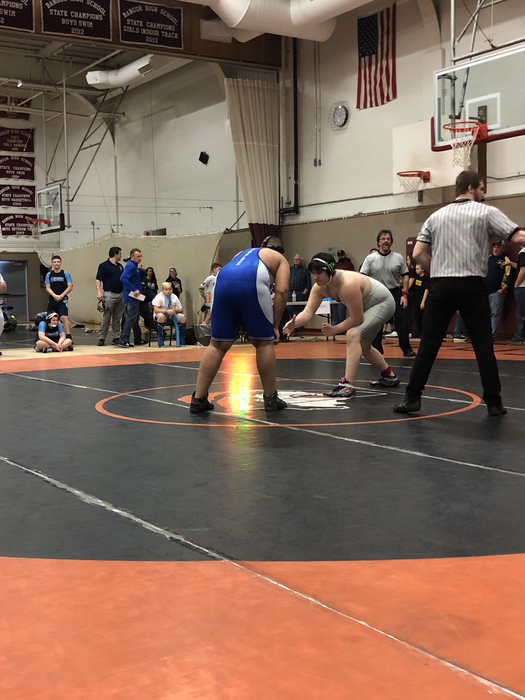 All four LMS wrestlers qualified for states! Xander 2nd, Geo 3rd, Sam and Robbie both 4th. On to Belfast next Saturday with 9 out of 16 of our kids qualifying. 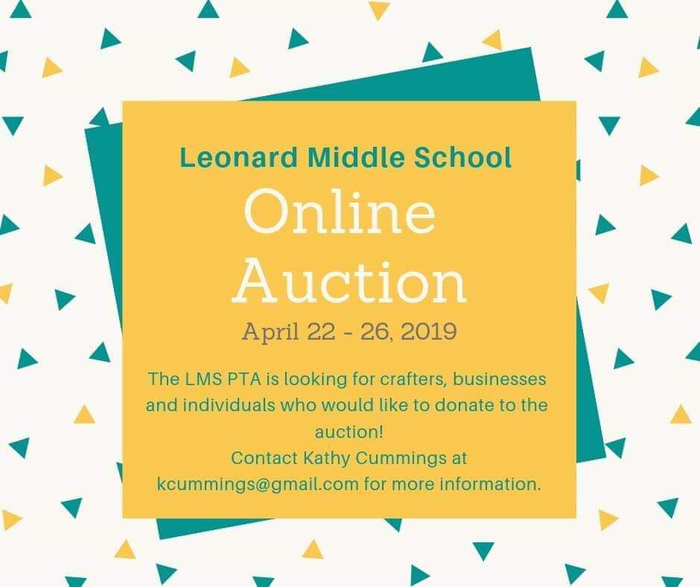 LMS yearbooks are on sale now! They are $25.00 with name personalization included. Order forms will be sent home with students or you can order online at: www.schoolannual.com Click on "Buy your student's yearbook" and enter school name, city, and state. 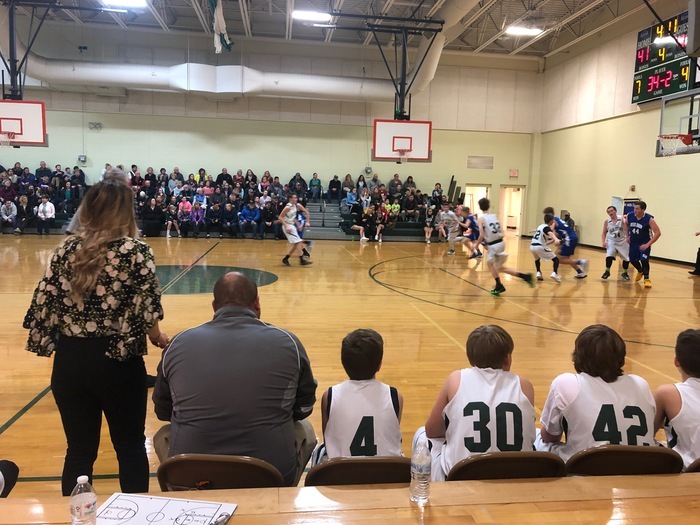 Congratulations to LMS, Ridgeview, and Troy Howard Schools for an awesome afternoon of MS unified basketball. Sportsmanship, fun, along with some great dancing was displayed throughout the game! Thank you everyone who came out to support all these athletes! Go Coyotes! 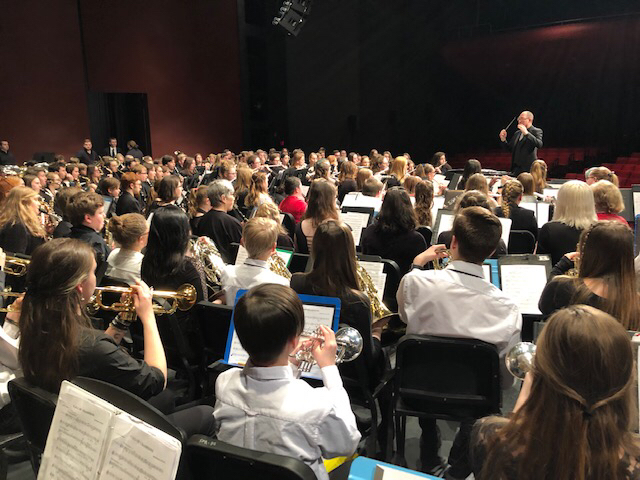 The LMS Symphonic Band performed in UM’s Concert for a Cure last night on the Collins Center Stage. After each of the performances, all of the bands combined on the stage for a final piece featuring 260 musicians. Great music for a great cause. Bravo! 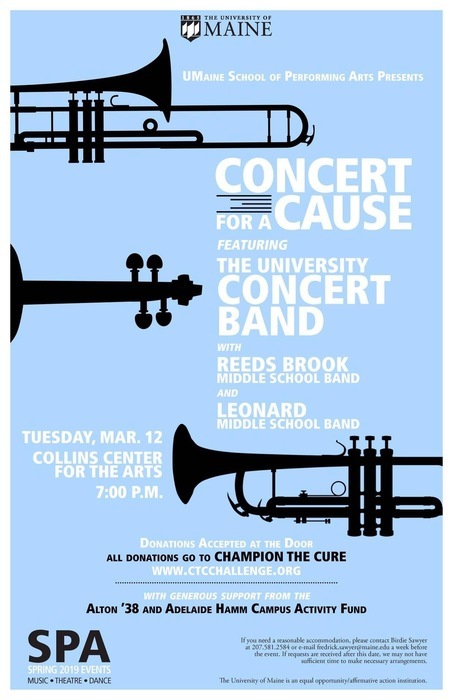 Concert for a Cause at the Collins Center this week! 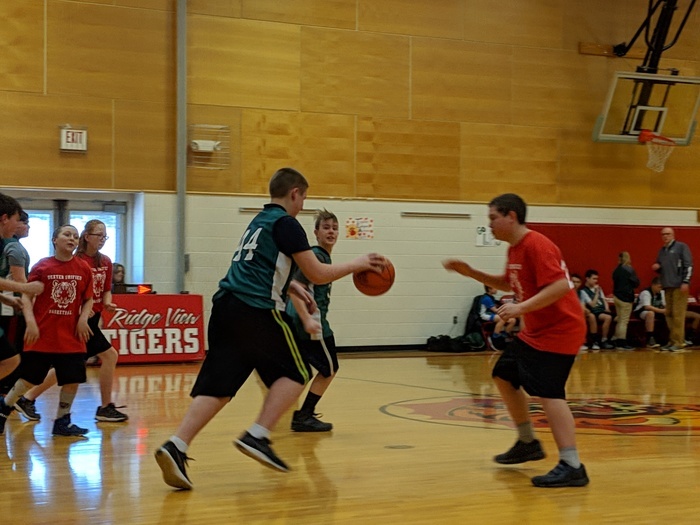 Our first LMS Unified basketball game was a huge success yesterday up at Ridgeview Community School. Thank you to all participants for their hard work, being great teammates, and their sportsmanship! Go Coyotes! 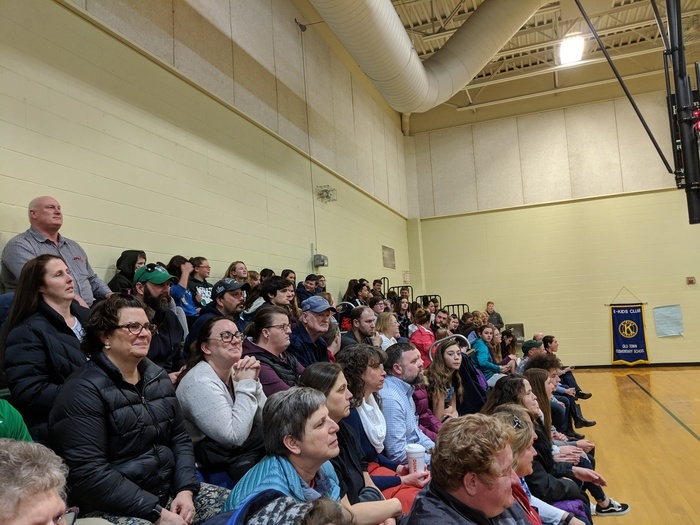 Two important updates/reminders: Due to the Old Town-Orono Hockey team making the regional finals, the OTHS open house has been moved to: March 13th from 6 – 7:30 PM. Students in RSU#34 do not have school on Friday this week as it is a professional development day for our staff. 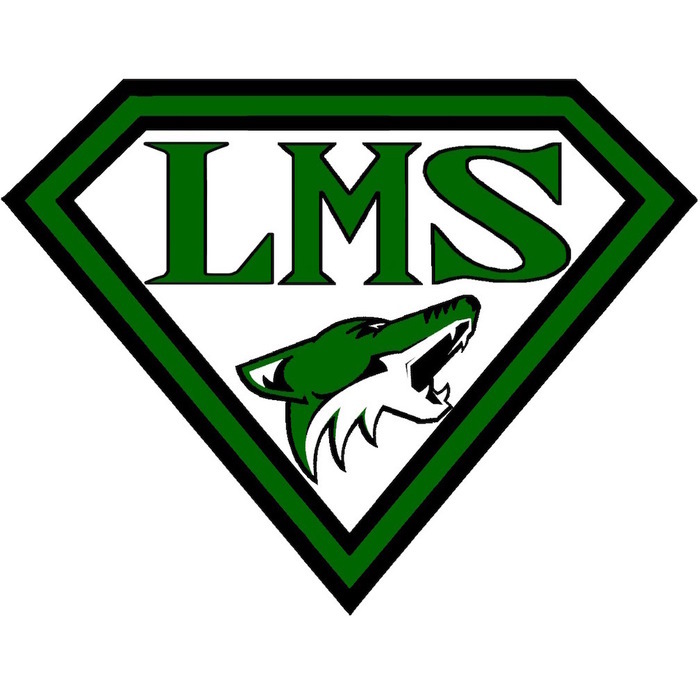 The LMS-PTA will meet on Tuesday, 3/5 at 6PM. 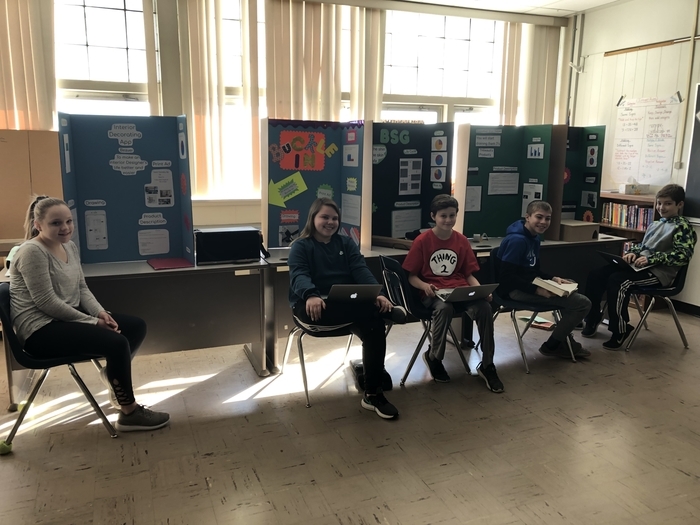 7th grade Invention Convention is underway. Our young inventors are hard at work pitching their ideas to judges, staff and fellow students. 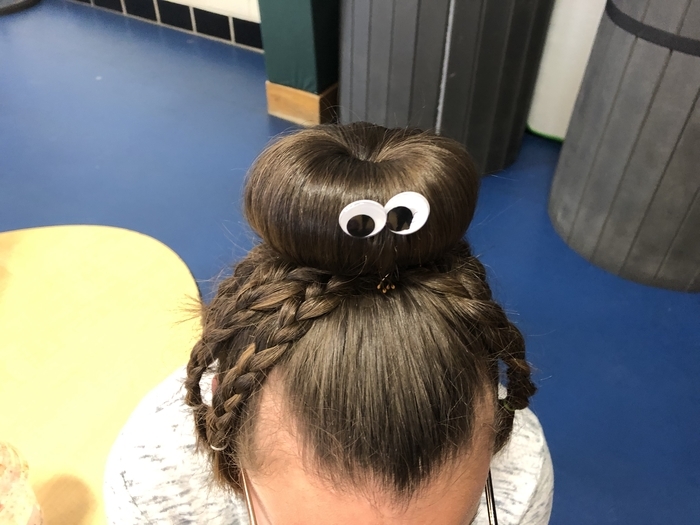 Nice work seventh grade! Dear LMS Chorus, Our accompanist, Carol Lander, has broken her arm. She is unable to play piano for a few weeks. 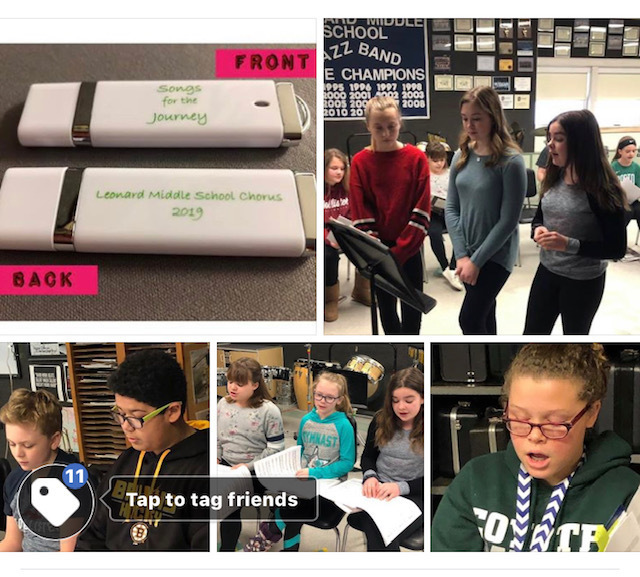 As our chorus students have worked very hard and are very proud of our "Songs for the Journey" project, we want to ensure that we set them up for success at the recording studio and concert. 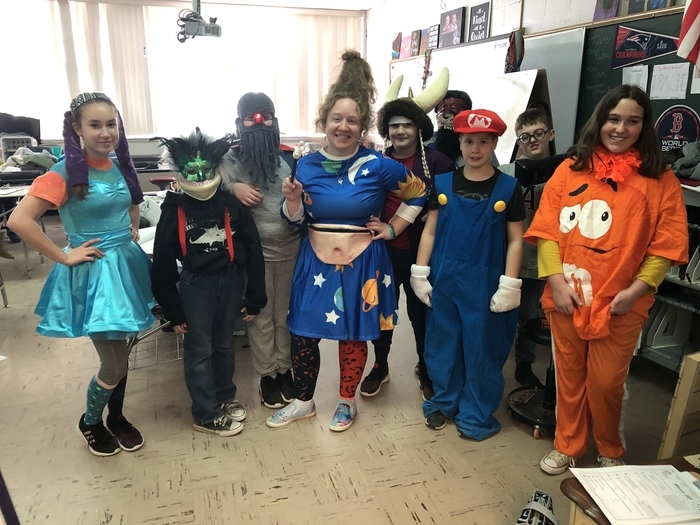 Mrs. Lander is a crucial part of what we do; both for her musical skills and her connection with the kids. The students and I all feel that waiting for her to heal is the best option. So, we have postponed our recording session to Friday, April 26th, and the concert to Monday, April 29th. We feel that this was in the best interest of the group. We look forward to performing for you then. Thanks for your understanding and flexibility. 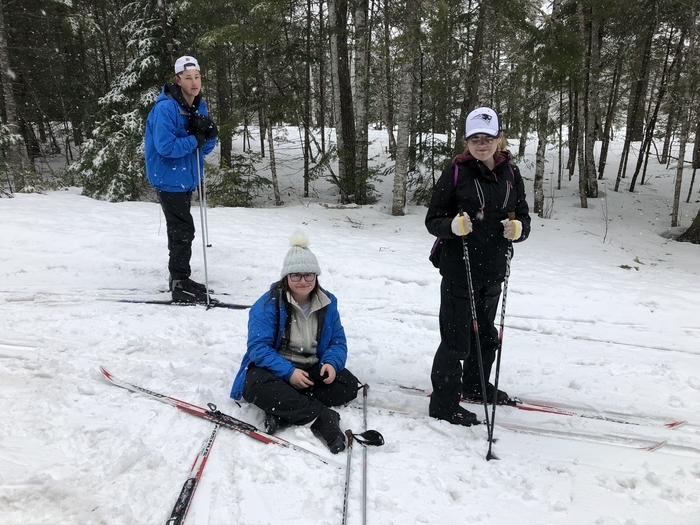 A few photos from the 7th grade trip to Millinocket for some snowshoeing and cross-country skiing. 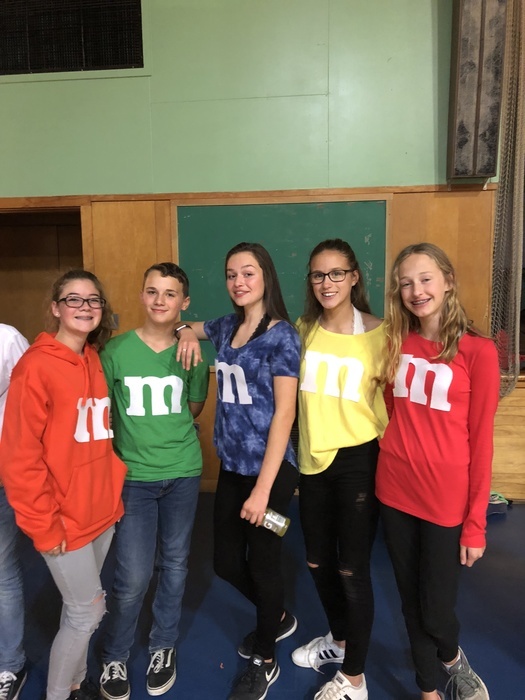 The Leonard Middle Chorus in Old Town, Maine, is using music as a way to support cancer patients, survivors, and caretakers. These are just a few of the many talented young musicians who have been hard at work preparing to spend a day at a recording studio in early March. While there, the LMS Chorus will record four songs, all of which fit their chosen theme of “Songs for the Journey”. These beautiful songs, each with a message of unity/support/strength, will be available for purchase on a flash drive for $12. All proceeds from sales will be donated to EMMC’s Champion the Cure to support local cancer research. 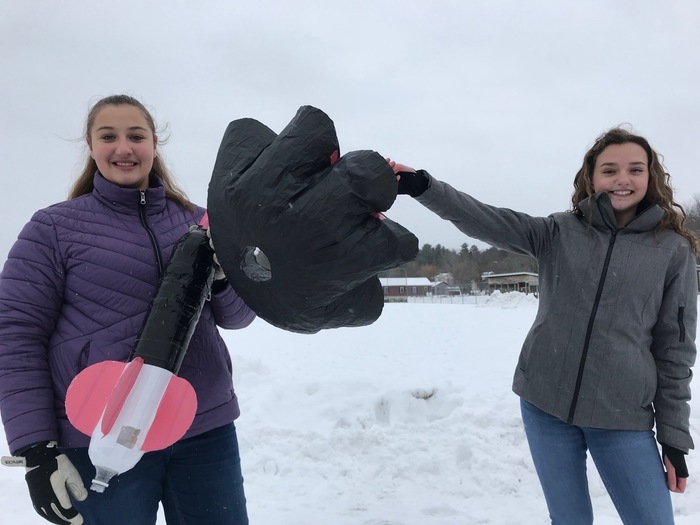 Those interested may purchase a drive for themselves, or have the option to purchase one as a gift to a cancer patient at the LaFayette Cancer Center in Brewer, Maine. If you would like to purchase a drive for yourself, or one to be sent to LaFayette, please contact the group’s teacher, Shianne Priest, at 356-8512 or send a message on Facebook. 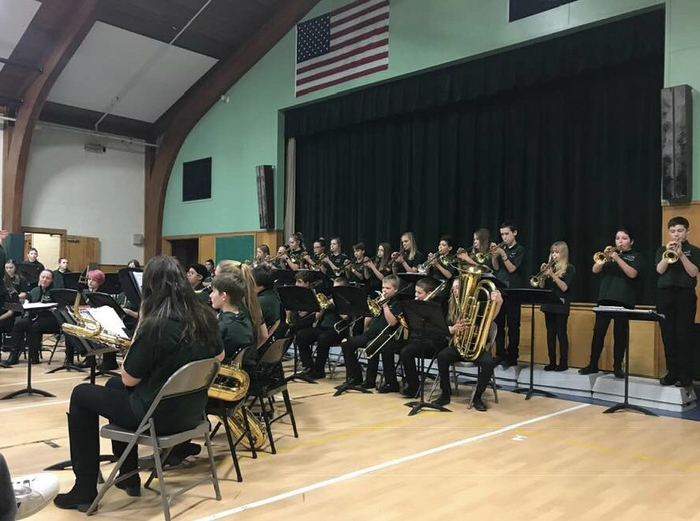 The LMS Jazz Band and Jazz Ensemble shared an evening of music with the Old Town High School jazz groups last night. We loved having our former students with us again, and of course, hearing our own LMS musicians. Bravo! 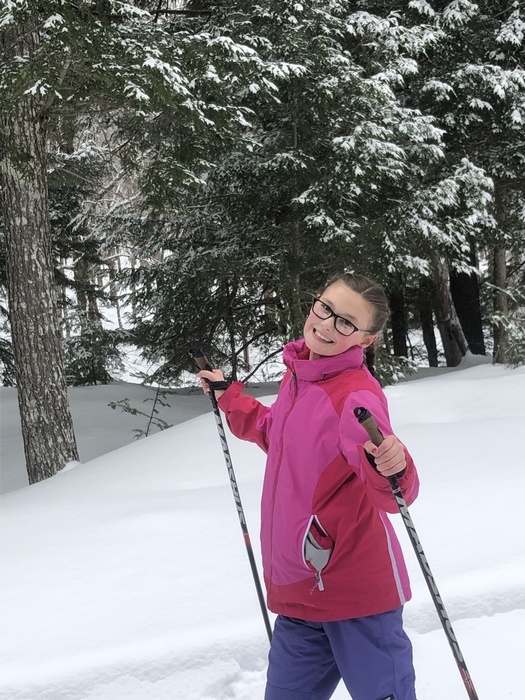 No school today, Wednesday, 2/13/19. From Mrs. OConnell The Raspberry PI weekend computer workshop at UTC for middle school students was a huge success. There’s more to come. Stay tuned. 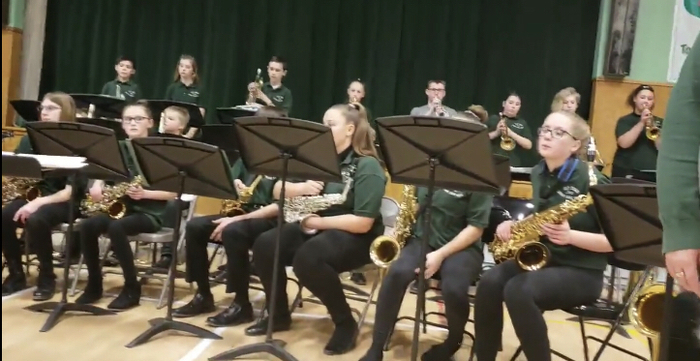 The District 5 Jazz Festival, originally scheduled for this Wednesday, has been postponed (due to predicted weather) to Wednesday, February 27th. 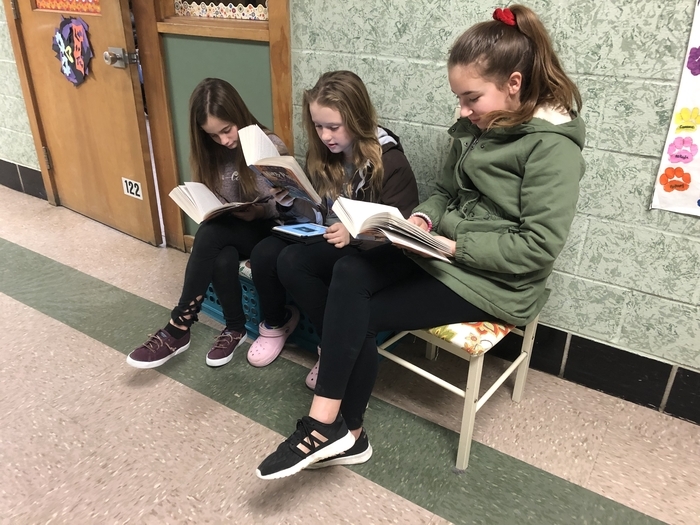 Reading along and listening during our Read, Write, Think block. These girls are soaking up Harry Potter! 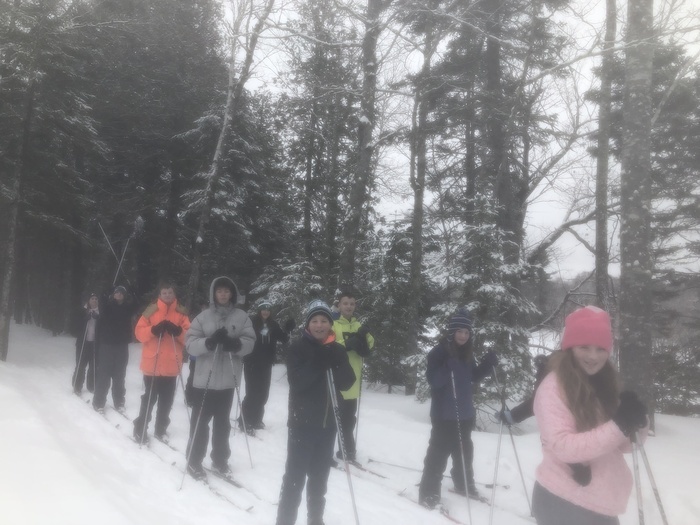 Some Thursday outdoor adventure for our 7th graders on their MOEP trip! 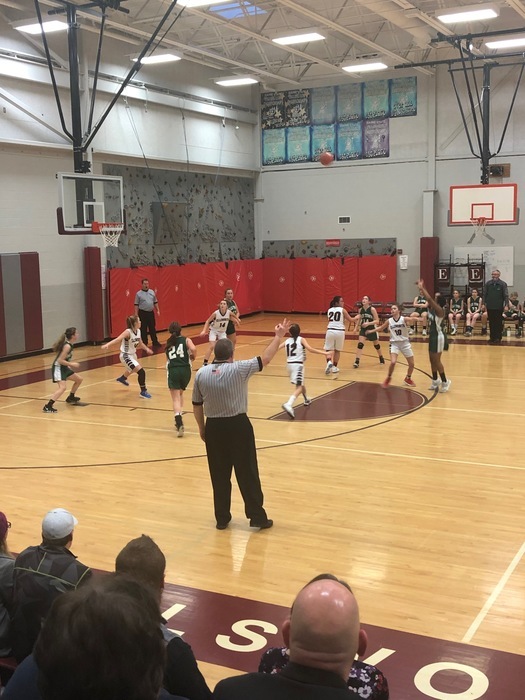 Our LMS Girls Basketball Team's season ended yesterday with a quarterfinal loss at Ellsworth. Coach Cowan was impressed with the teams effort and improvement throughout the season! 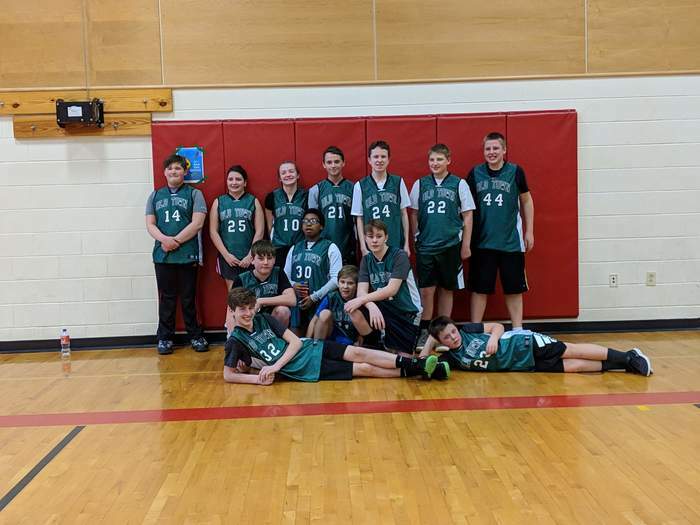 A big thank you to all winter athletes for all they did representing LMS. Go Coyotes!!! 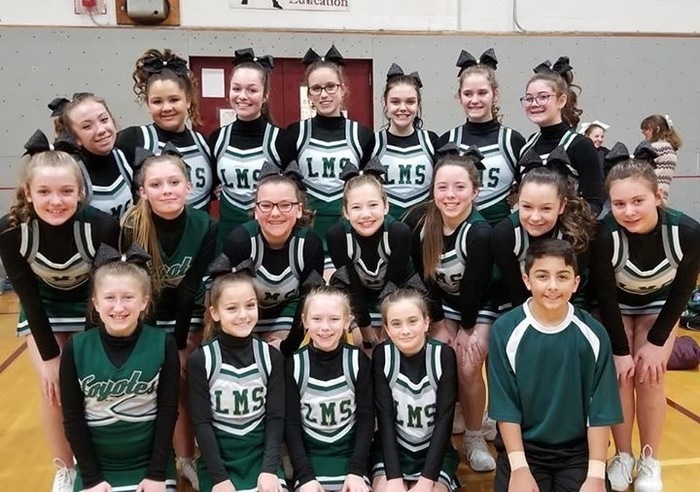 Congratulations to our LMS Cheerleaders who competed in their final competition Saturday at Bangor High School. Coaches were extremely proud of the team's performance as well as their drive all season long! Way to go Coyotes! 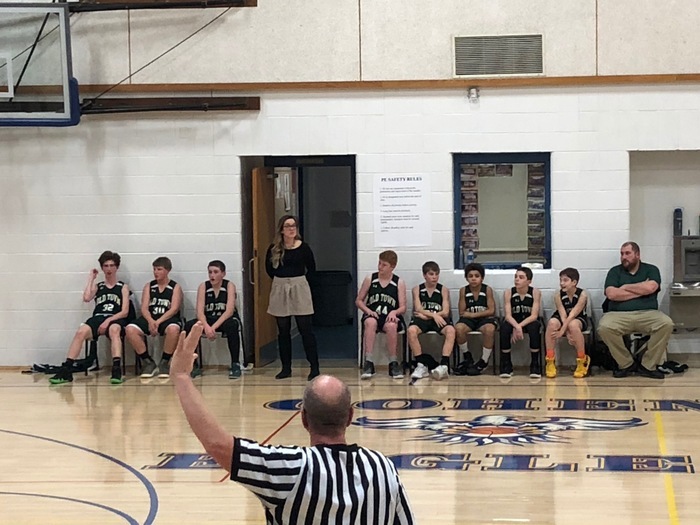 The LMS boys basketball team concluded their season on Friday with a quarterfinal loss to a hot shooting Cohen team. We are proud of the growth and hard work the team exhibited this season! Go Coyotes! 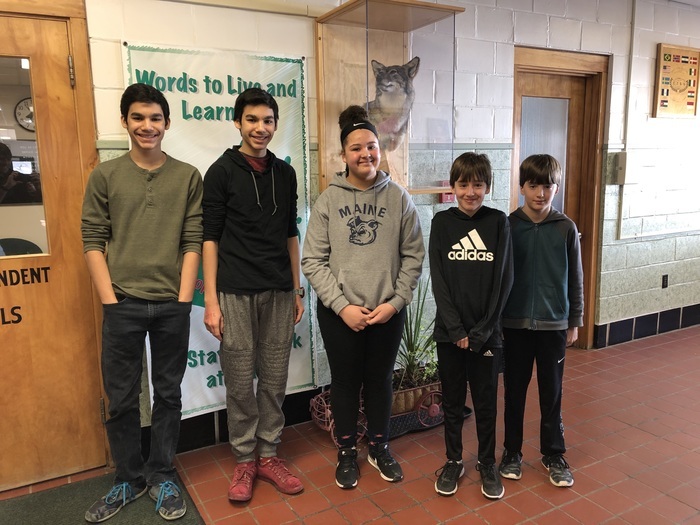 LMS January Musicians of the Month: Brooke Blockler, 8th (flute and bass guitar) Perry Rondo, 8th (trumpet) Morgan Davis, 7th (trumpet, euphonium, chorus) Livia Lynch, 7th (flute) Kylie Tilton, 6th (flute, chorus) Sam Cote, 6th (percussion) Congratulations to these students for a January of musical growth, leadership, and passion. 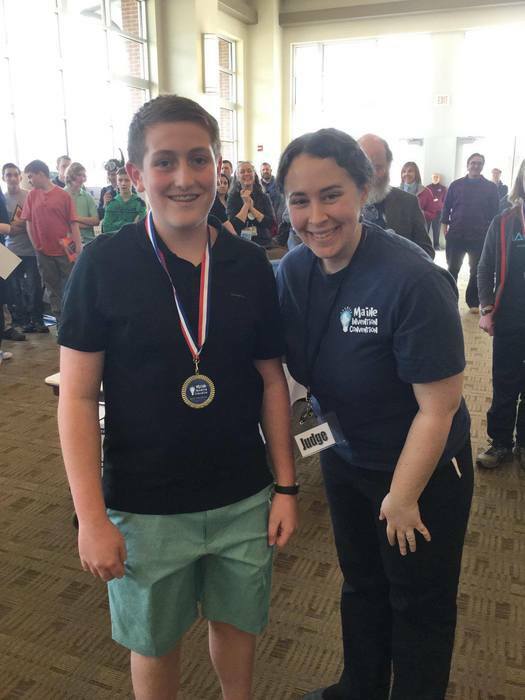 The 2019 Leonard Middle School Geography Bee Champion is Teddy Stoup. Teddy was the highest scorer in the qualifying round and followed that up with an impressive performance in the final round. Jesse Bouchard was runner-up followed by Amara Francis as the second runner-up. All participants gave their absolute best and rooted their fellow competitors on. 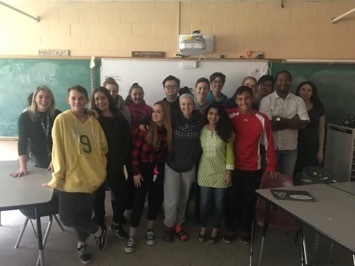 Finally, a big thank you to both Mr. Kirkland, Ms. Whedon, and Mrs. Ford for their help and support in making this happen! 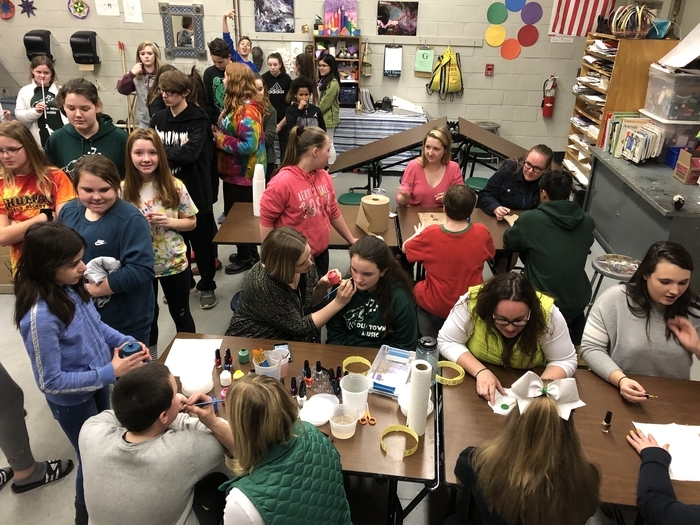 Here are just a few photos from our OBS students visiting LMS on 1/29. 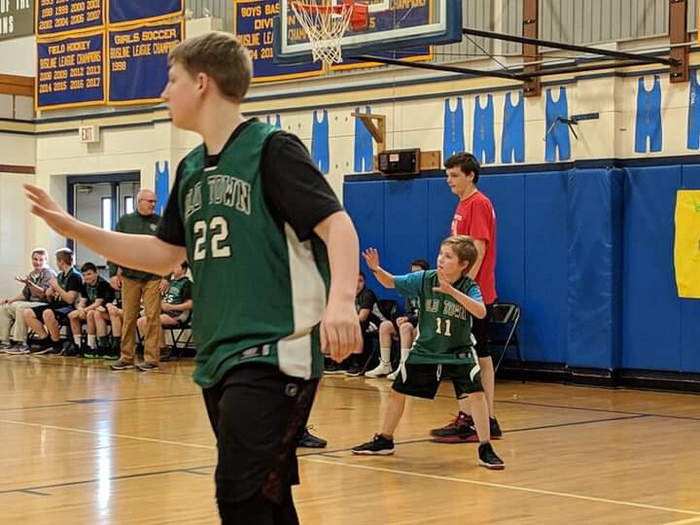 LMS Basketball Update: Due to tournament scheduling our regular season Bucksport game on TH is canceled. Quarterfinal tourney Schedule: Friday, 2/1, LMS Boys @ Cohen 5:45 pm, bus 4pm. 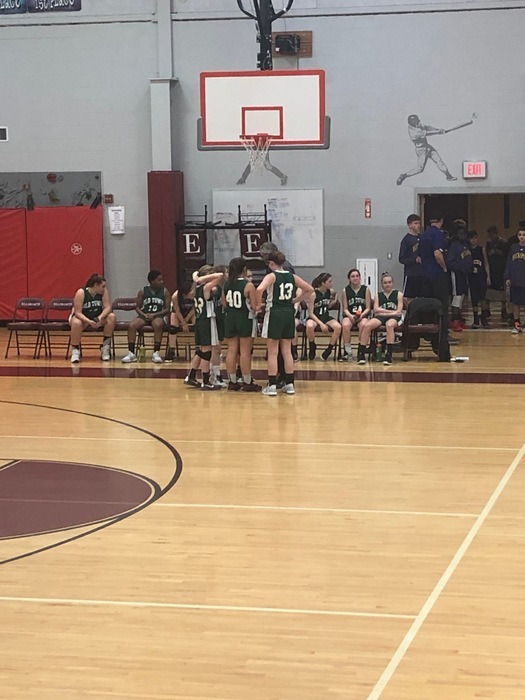 Monday, 2/4, LMS Girls@ Ellsworth, 4pm, bus 2:20. Please see our calendar for updated practice times. Go Coyotes! No school today, Wednesday, January 30th. 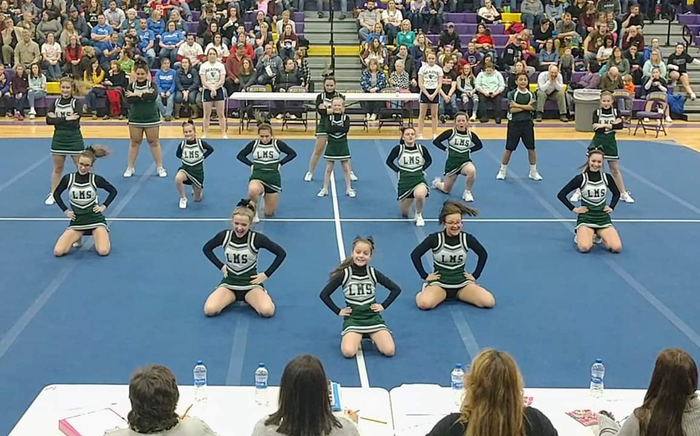 Proud of our LMS cheerleaders for their 5th place finish at the Golden Bucks Invitational. Go Coyotes! Progress reports went home with students today. Please review your student’s scores and the comments left by teachers. If you have any questions please contact your student’s advisor. 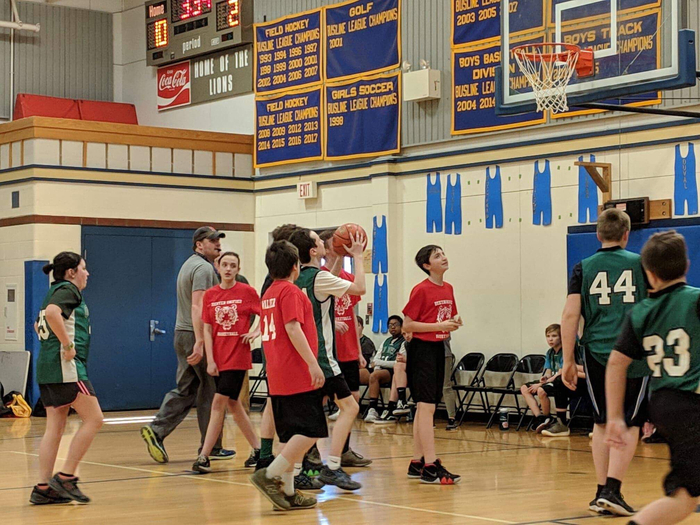 Due to power issues at Bucksport Middle School today's basketball games will be postponed to a different date. LMS will not have basketball practices today as well. 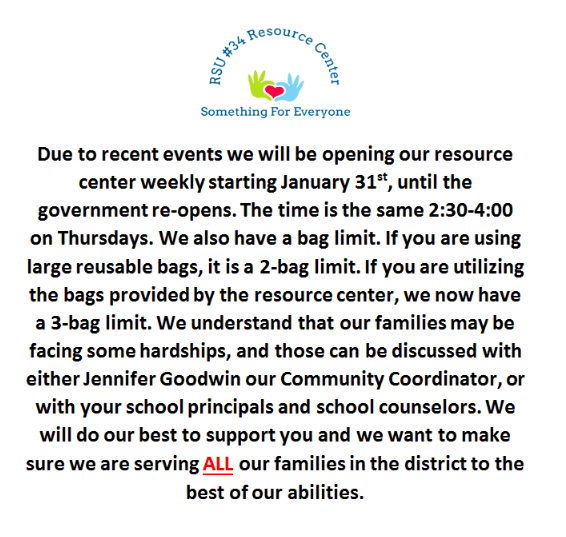 RSU 34 Resource Center Update. 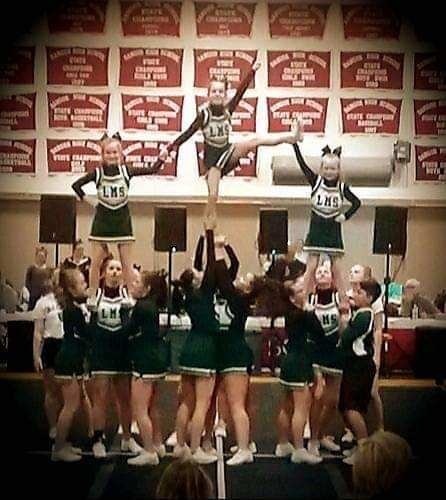 Congratulations to our LMS cheerleaders who placed 4th in their first competition of the season at Brewer High on Friday evening. Coaches and fans were extremely proud of the team. Go Coyotes!!! 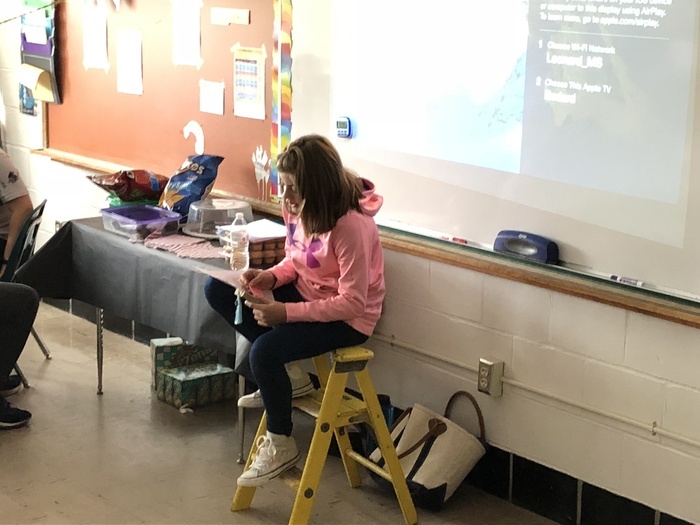 The student Geography Bee will be held on January 30th. There will be practice sessions held in Mr. Schlaefer's classroom (124) from 2:45-3:45 on 1/23 and 1/28. We do try to avoid conflicts between our school-sponsored events. 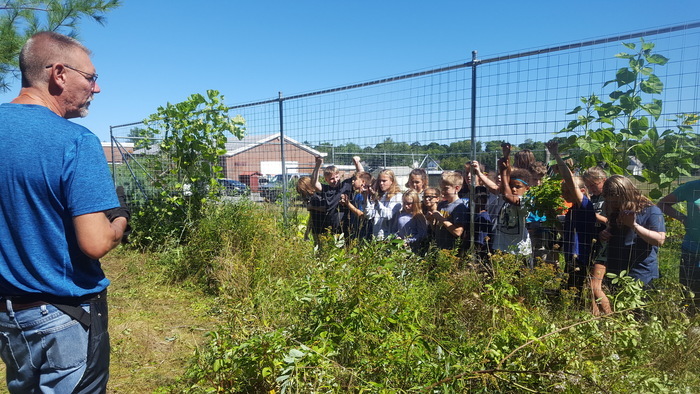 With the number of activities going on at LMS, this is a daunting task (and that’s a good thing by the way!). 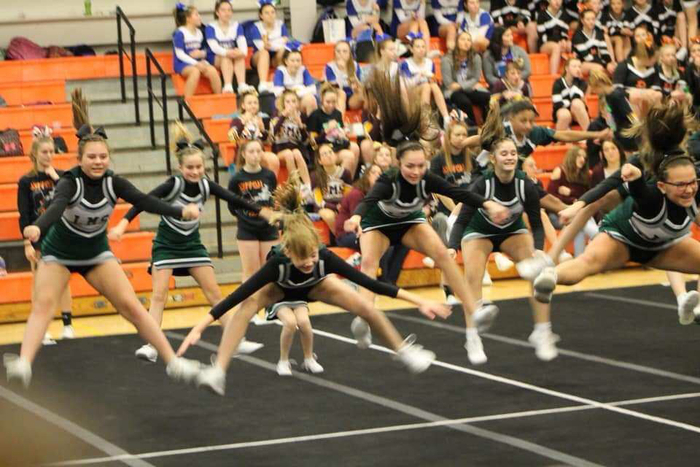 We realize that there is a cheering competition on the day of the Snowball. To allow more time for our cheering squad to return from the comp and prepare for the dance, we will move the dance to 7-9pm instead of 6-8pm. 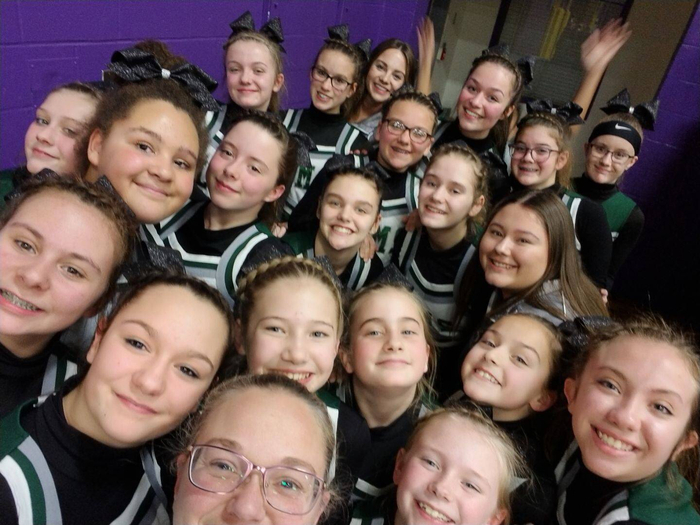 We are looking forward to a great dance AND a great cheering performance! 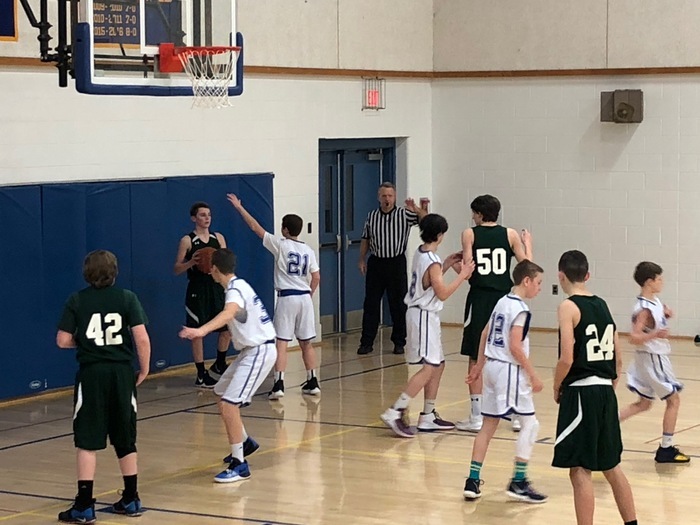 Two great basketball games yesterday at Reeds Brook, with the LMS boys victorious 57-50. 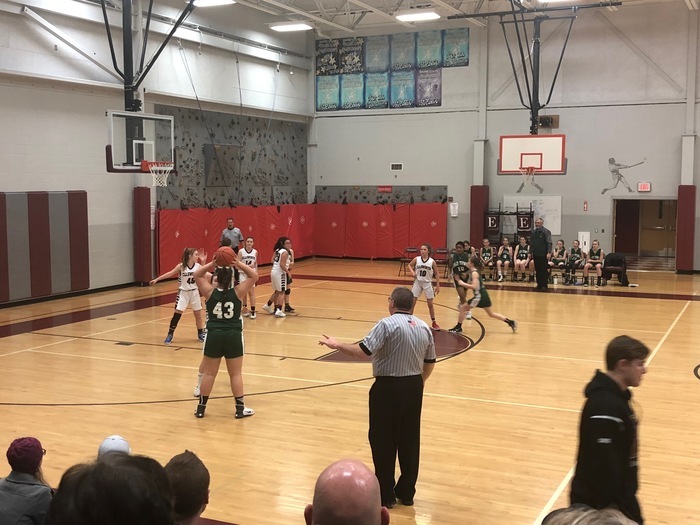 On the girl’s side, the Coyotes fell short with a 2 point loss with a chance at the buzzer. Today the teams host Cohen with the girls kicking things off at 3:30. Way to Coyotes!!! 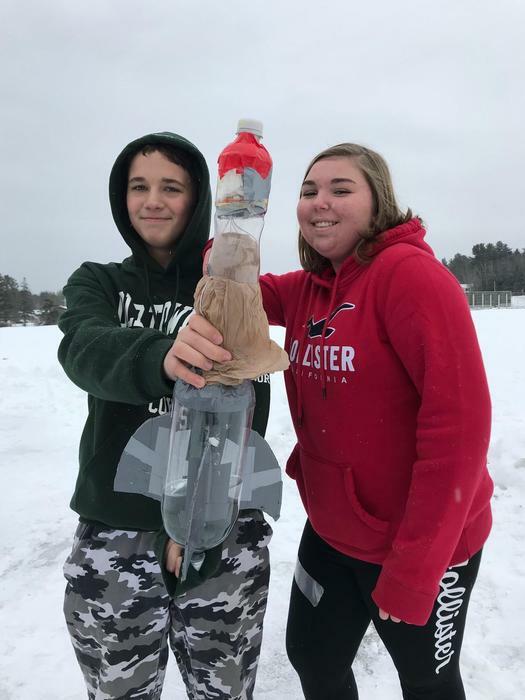 Our 8th graders have been building water-powered rockets. 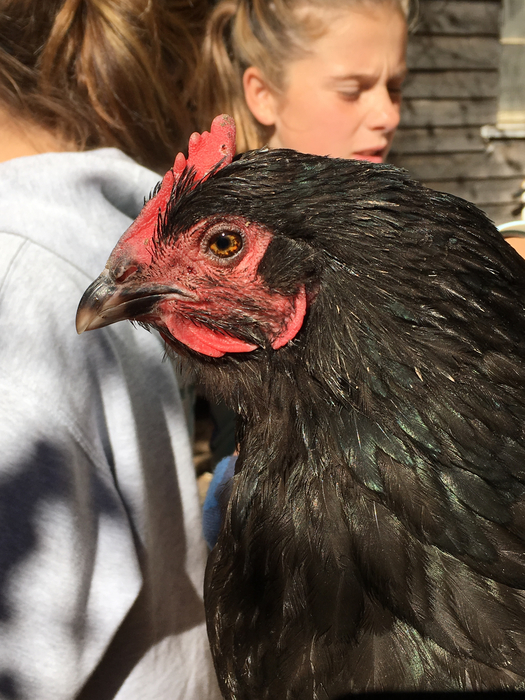 Several creative designs have prevailed on the mission for the longest flight time and the safe transportation of an unbroken egg. ALL after school activities have been canceled for today, Wednesday, January 9th. 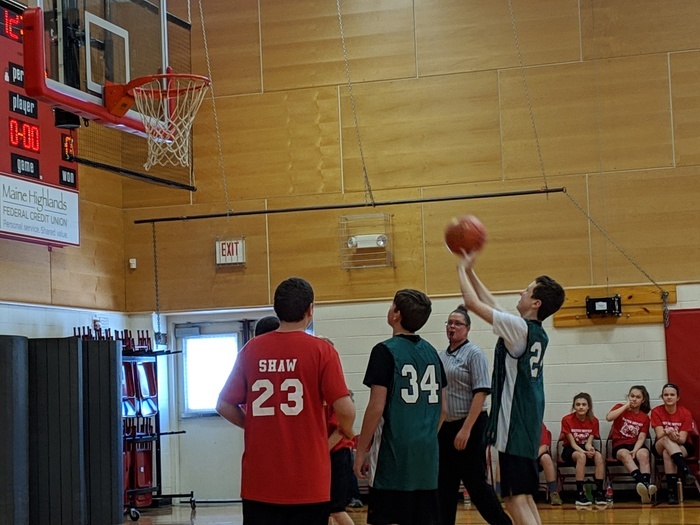 Yesterday's basketball games vs Cohen are now Friday, 1/11. Be safe! ALL after school activities have been canceled for today, Tuesday, January 8th. We are trying to reschedule today's basketball games vs Cohen for this Friday, 1/11, so please stay tuned. 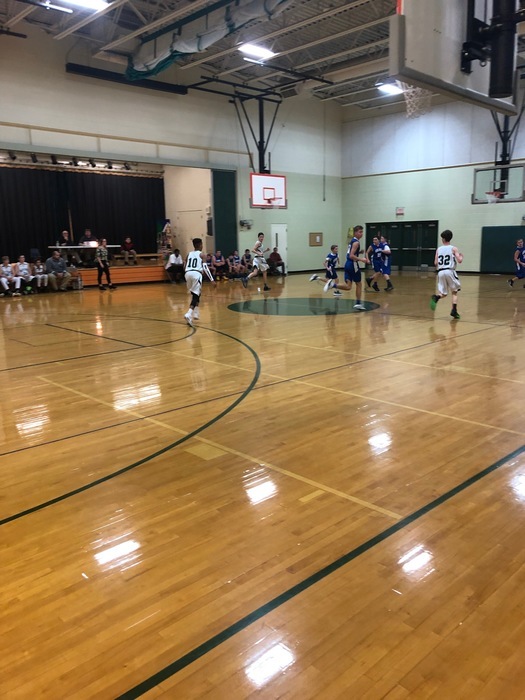 Our LMS Coyote Basketball Teams both were victorious over Bucksport Friday. The boys came away with a 61-35 victory and the girl’s team won 46-41. Their next game is home vs Cohen on Tuesday with the girl’s game kicking things off at 3:30. Way to go Coyotes!!! The next PTA meeting will be January 16th at 6pm. 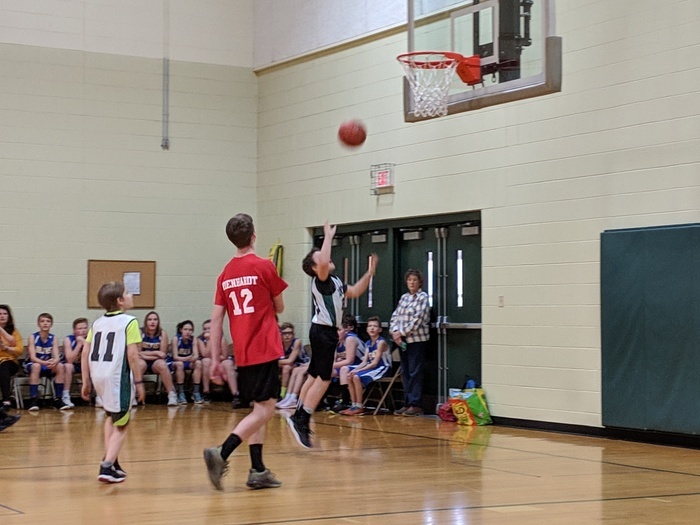 LMS Winter Sports pictures will take place tomorrow, 1/3/19, during practices. Envelopes will passed out today during practice. Thank you! 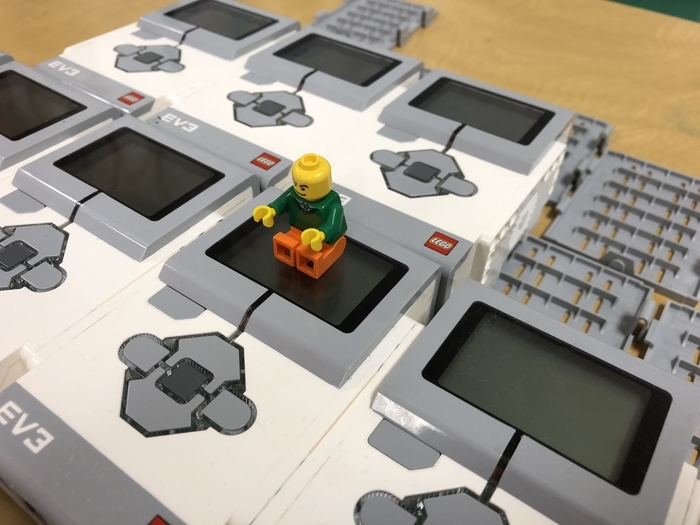 Happy 2019 and welcome back! We are looking forward to seeing all of our students back at school tomorrow, 1/2/19. About 20 of our 6th graders invited their parents in to share in the Gift of Reading celebration. 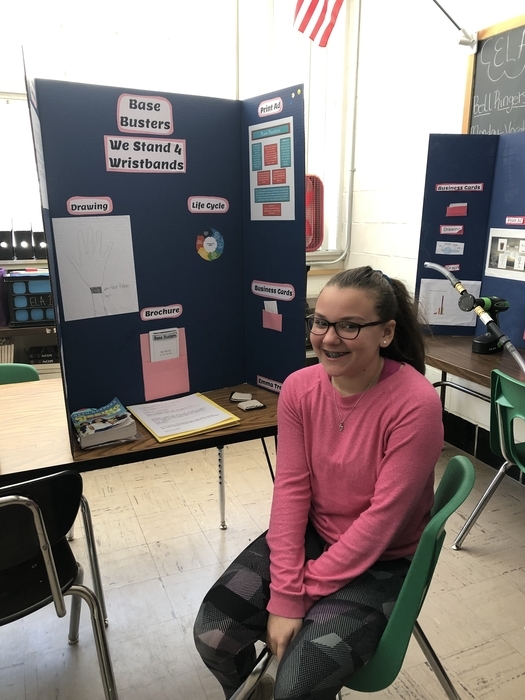 Thank you to the families who were able to participate and kudos to the all the students who were brave enough to present to an audience of adults! 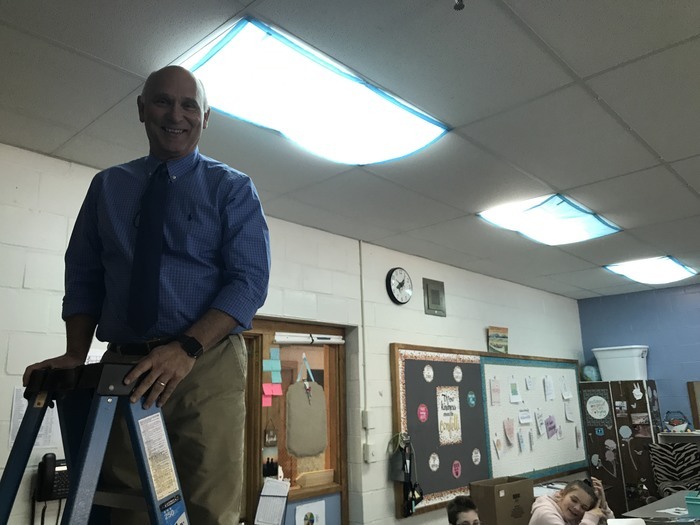 Mrs. Murchison used me on a ladder to demonstrate the coordinate grid as we plot points on the X and Y axis. 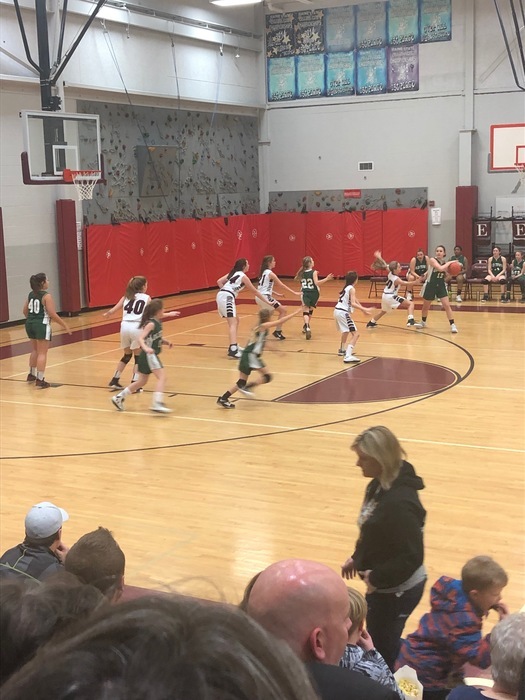 LMS Girls B-ball came up short against Hermon 43-36. Coach was impressed with the team's effort and is looking forward to great things after break. On the boys side, the Coyotes picked up their first win 52-42! Coach was very pleased with the teams performance. 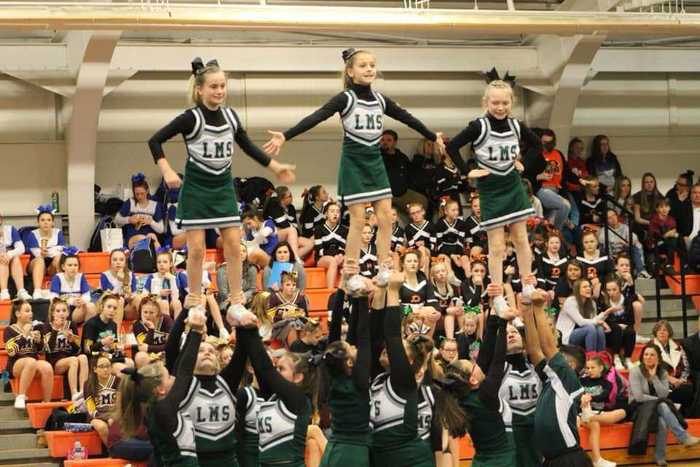 Way to Go LMS! Bus 613, the Bradley bus, is running behind schedule this afternoon. Sorry for any inconvenience this may cause. 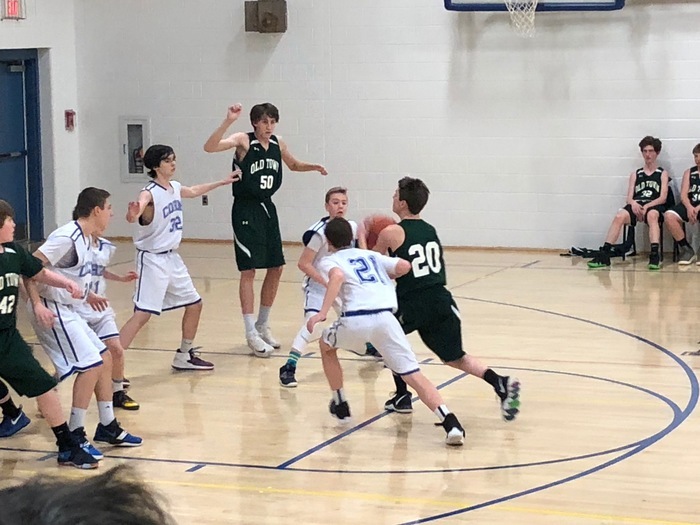 Today's Basketball games at Hermon will now be Thursday ,12/20 at Hermon Middle School, with girls game at 3:30 and boys 4:45. No school today, Monday, 12/17, due to inclement weather. 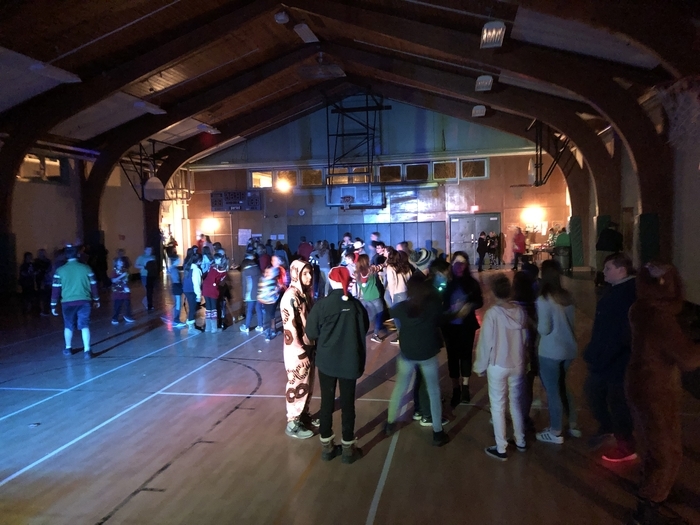 Ugly Sweater Dance 2018 coming to an end this evening, P/U at 8. 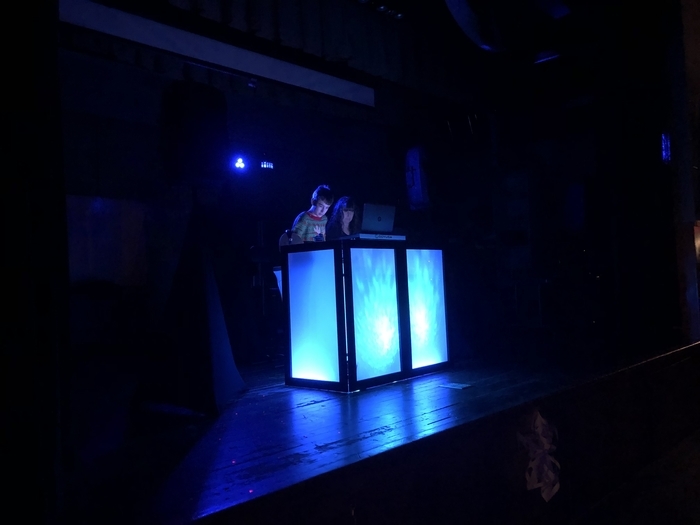 Big thank you to DJ Keegan Plourde! Builders club is collecting hats to donate to the Bangor Area Homeless Shelter and Old Town police department. Students made a colorful donation box that is outside the office. Please bring in new (scarfs and mittens accepted, too) or homemade hats by Friday, December 21st! Dear RSU 34 Families, This is a reminder that our Resource Center will be open to families on December 20th from 2:30-4:00, school vacation is the following week. We are stocked with toilet paper, paper towels, soups, snacks, pasta, cereal and more. Our Community Coordinator has made herself available for that day if you are unable to make the hours but could utilize the resource center to help over the vacation. Please reach Jennifer Goodwin @ 827-2508, to set something up. We will be open again on January 3rd from 2:30-4:00. 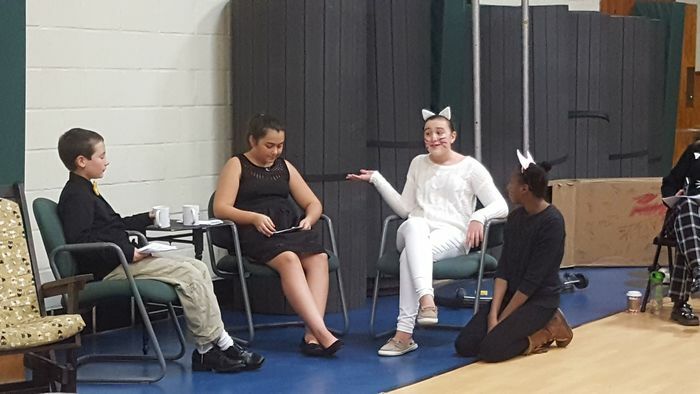 Our 6th graders put on a play during Student-Led Conferences. 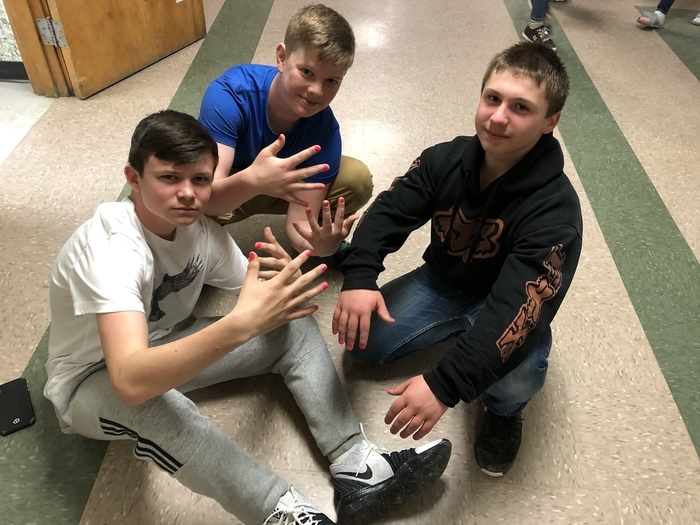 We have some serious drama talent here at LMS! Looking forward to more productions ahead. 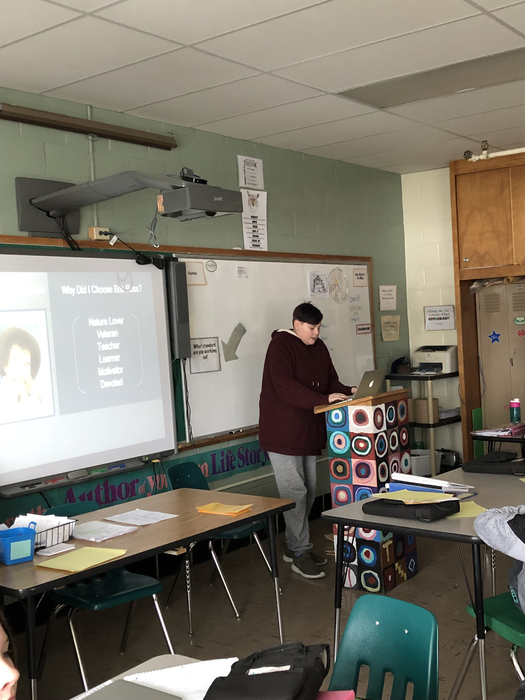 7th graders hone their public speaking skills with Mrs. Tuttle and Mr. McLaren. 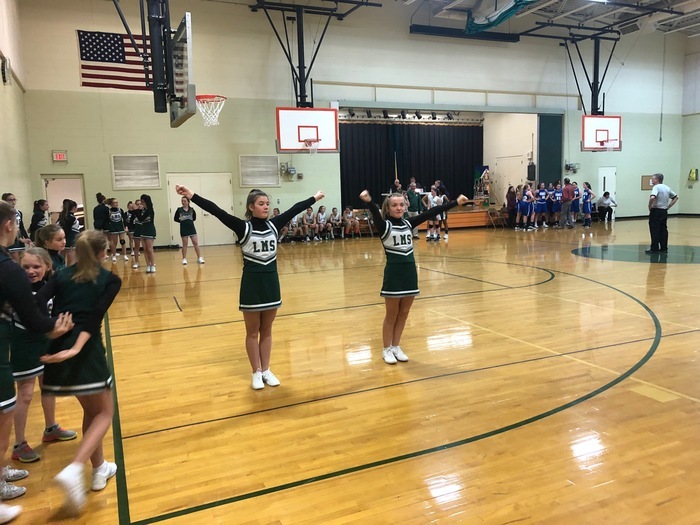 Great effort and energy yesterday from both basketball teams and cheerleaders in our home opener. All coaches were very proud of their teams! Go Coyotes!!! 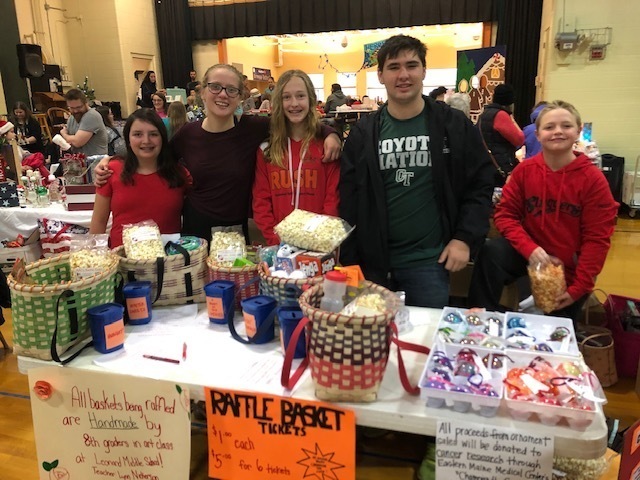 LMS Team RUSH hard at work on a Saturday morning selling tickets for raffle baskets. This project is to raise money for cancer research. 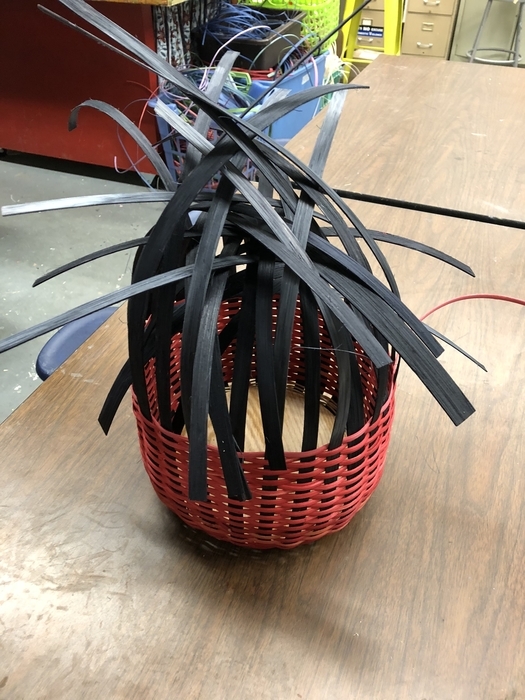 The beautiful baskets are made by 8th grade students in art classes. 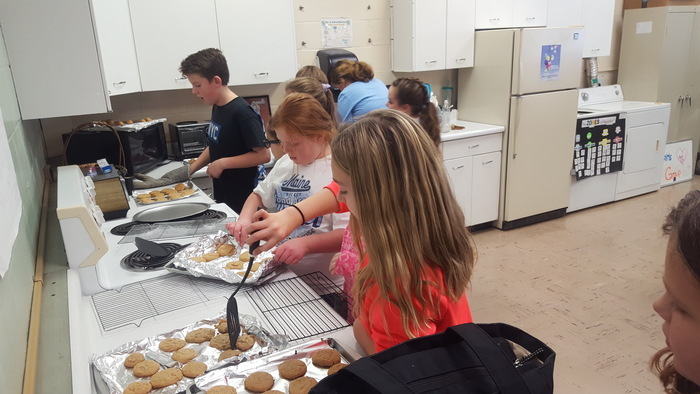 We love to see our kids giving back! 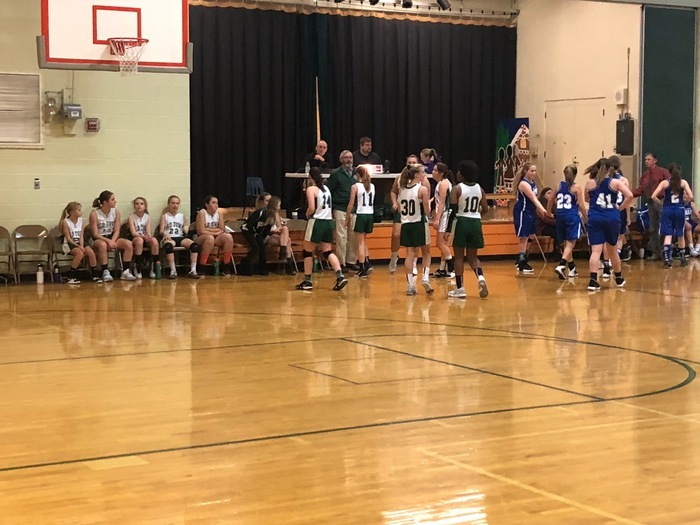 LMS Basketball gets things started today with games at the Cohen School. The girls game starts at 3:30 followed by the boys approximately 15 minutes after. Go Coyotes!!! 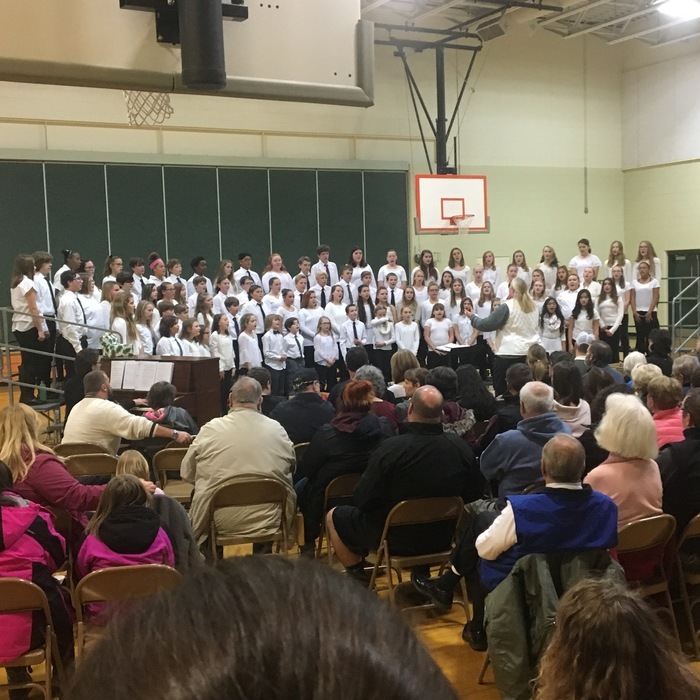 Please join us at OTES this evening for our chorus concert. Our kids have been working hard and sound amazing. They have so much joy to share with you tonight! 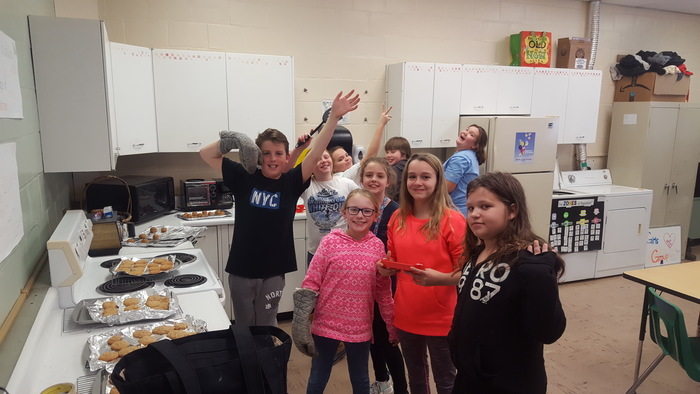 Students in the cooking elective have been busy making and baking in preparation for our Student-Led Conferences being held tonight! 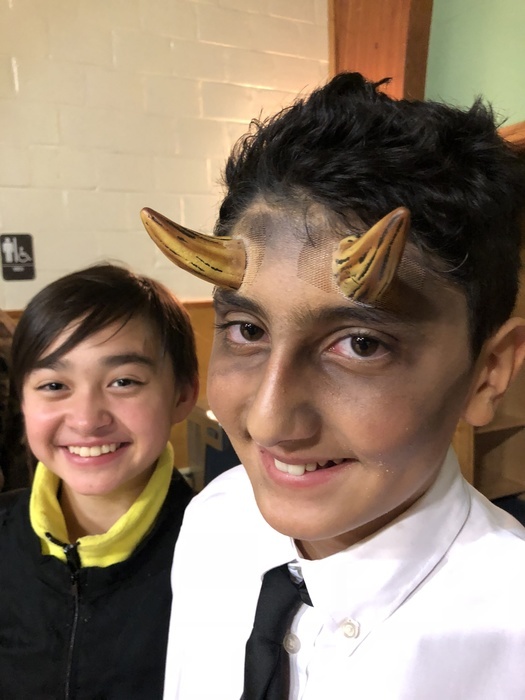 Come see their amazing work, watch a fun and quirky play, and enjoy a sweet snack provided by 6th grade! SLC's run from 3:30-6:30 this evening. Yesterday we held our staff v student badminton tournament. 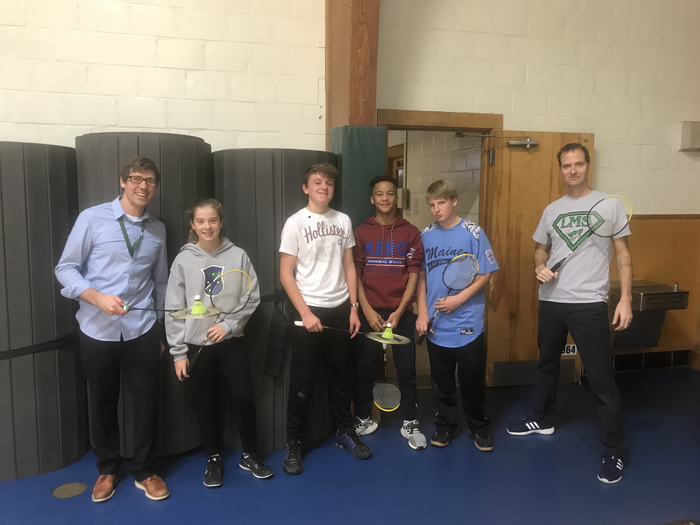 8th grade students participated in a semifinal and then faced the returning staff champions. It was a challenging match up and in the end the staff prevailed. 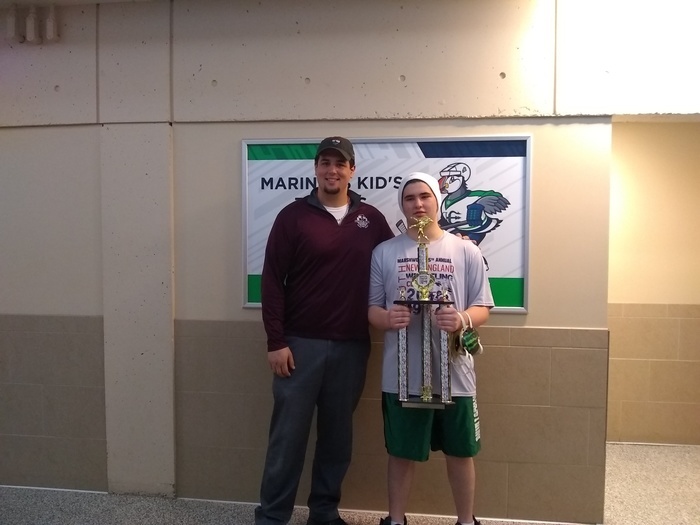 Kudos to all who participated, especially our second place student finishers Matthew Herrick and Davon Alston. Looking forward to seeing all of our students tomorrow as we return from the Thanksgiving Break. 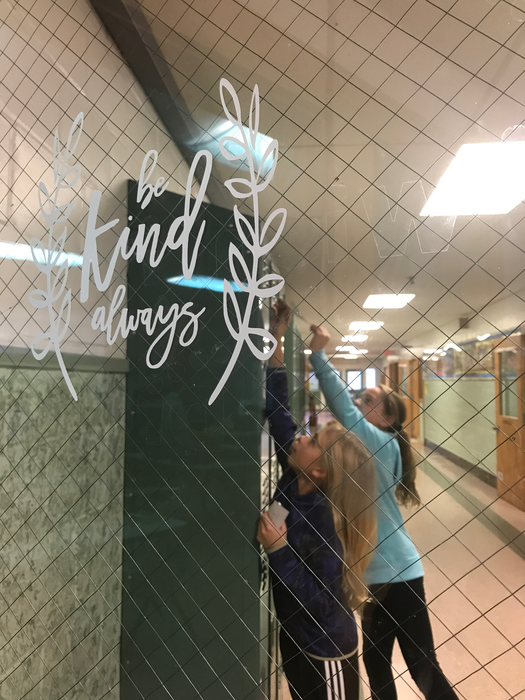 A group of 6th graders, led by Mrs. Murchison, has been doing random acts of kindness around the school with the message to "Be Kind Always". Let's expand those acts beyond the 6th grade hallway to our whole school! Today, November 20th, all after school activities are canceled due to weather, please drive careful. No school today, November 16th, due to inclement weather. 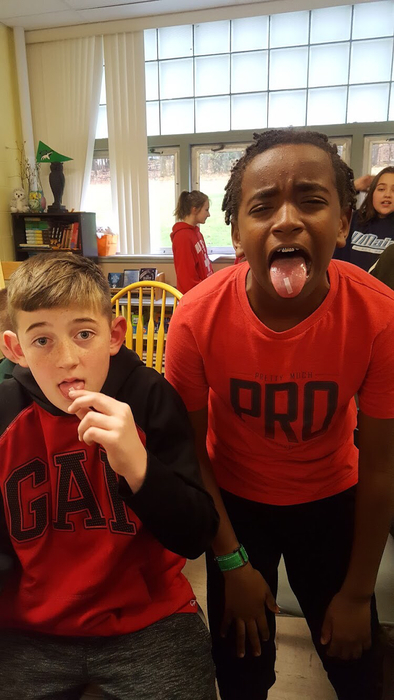 6th graders got to find out whether they have the genetic ability to taste PTC paper as they study inheritance and variation science standards. Great things happening all over our building today! 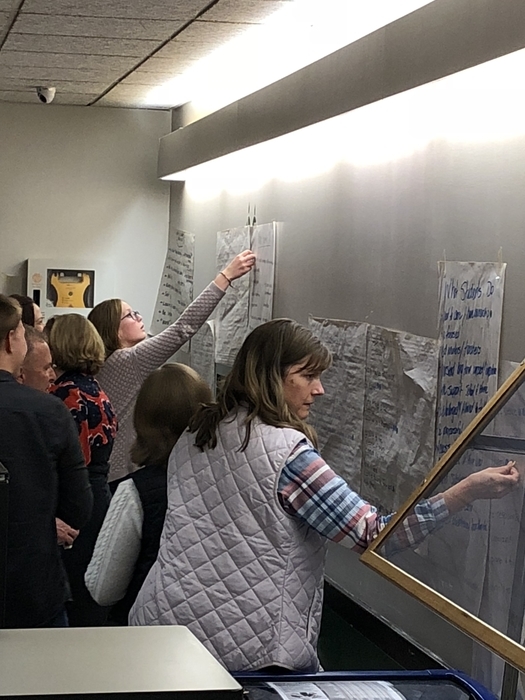 Two of the newest additions to our team, Lynn Nickerson in art and Hannah Dickinson in 6th grade were really showing off with some spectacular lessons. 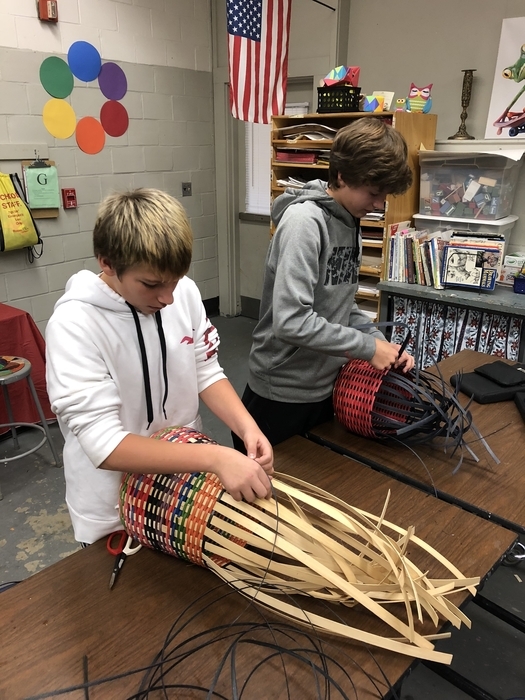 Traditional basket weaving in art elective and rock formation labs in 6th. 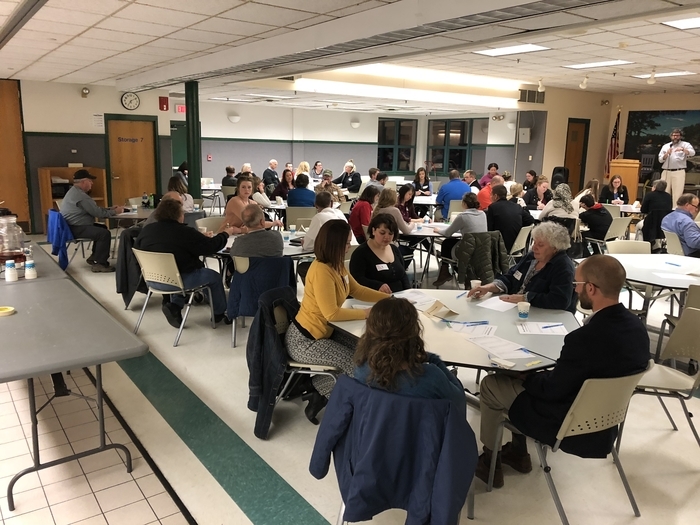 Thank you to all who participated in our LMS Visioning Forum this evening. 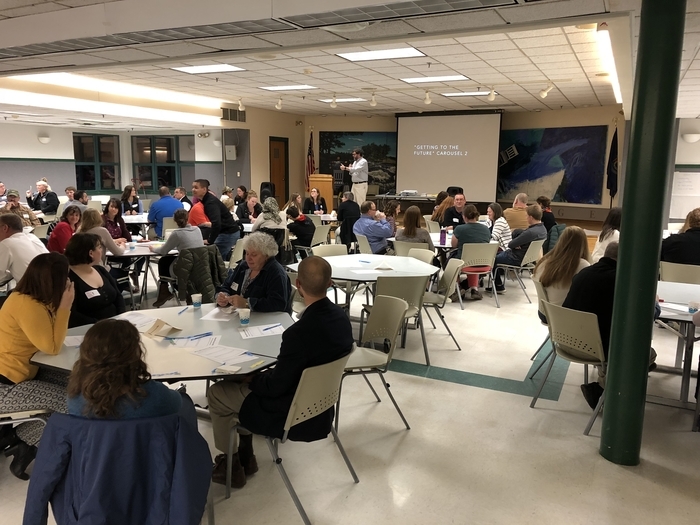 We are looking forward to continued work toward being the best middle school we can be! 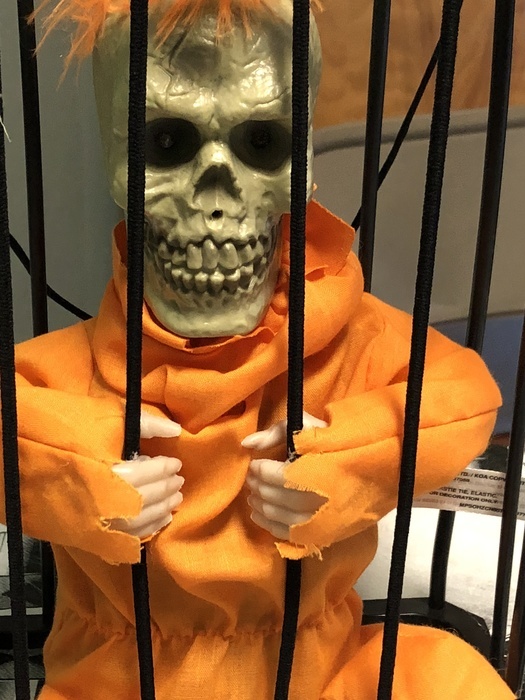 Our LMS-PTA would like to thank all of those that donated items and/or their time to the Halloween Dance. It was a huge success. 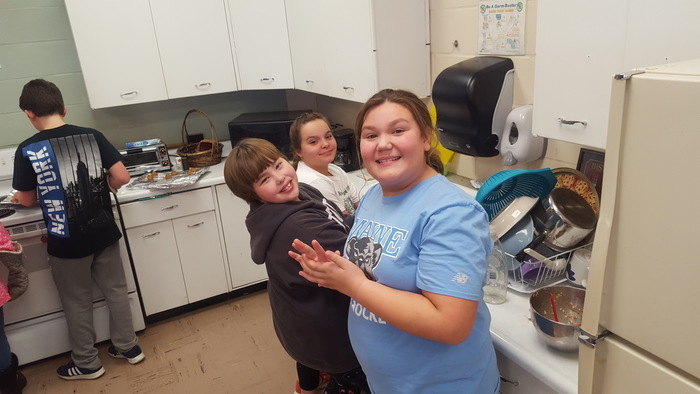 Our food service staff really go the extra mile to feed hungry kids and make them smile. 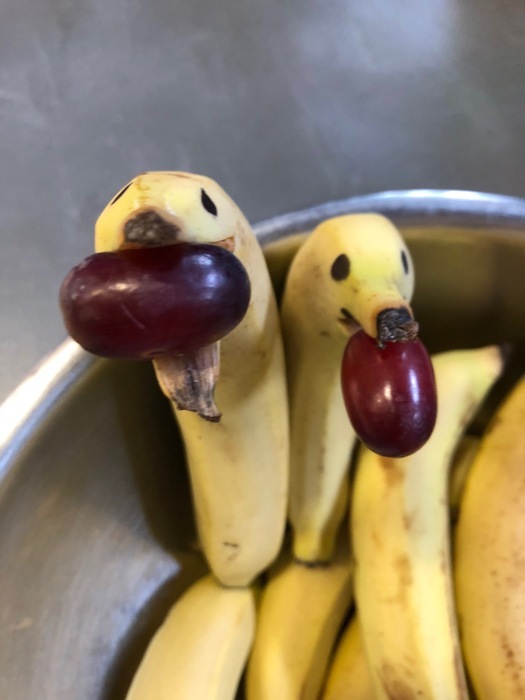 Check out these bird bananas! I am way behind on this one but these kids should not go without recognition. 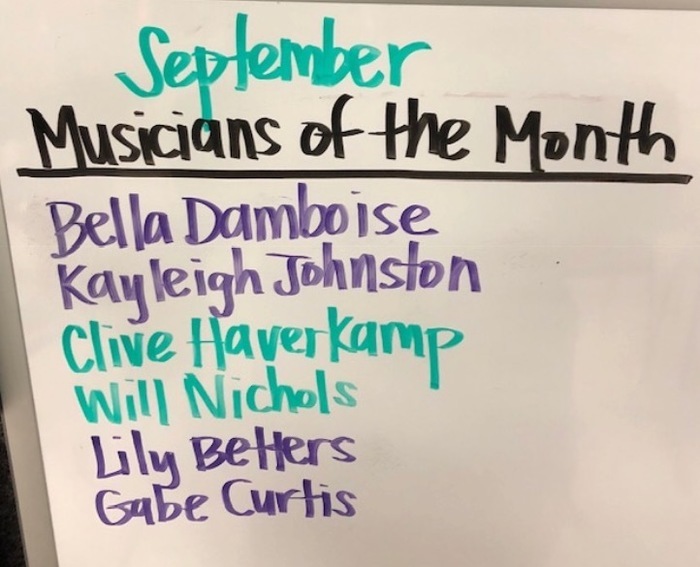 Here are our September Musicians of the Month! Picture retakes will be on Monday next week, 11/5. 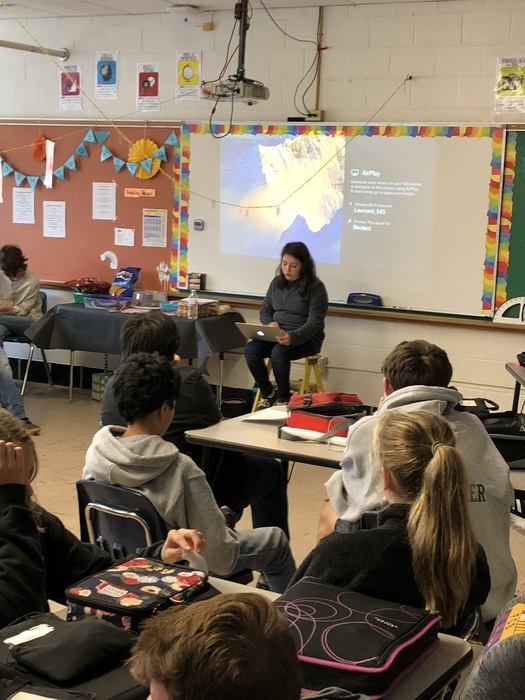 Students from 7th grade – homerooms from Mrs.Kenny, Mrs.Tuttle and Ms. Dickinson—visited the Cole Land Transportation Museum on Wednesday, Oct. 24th. 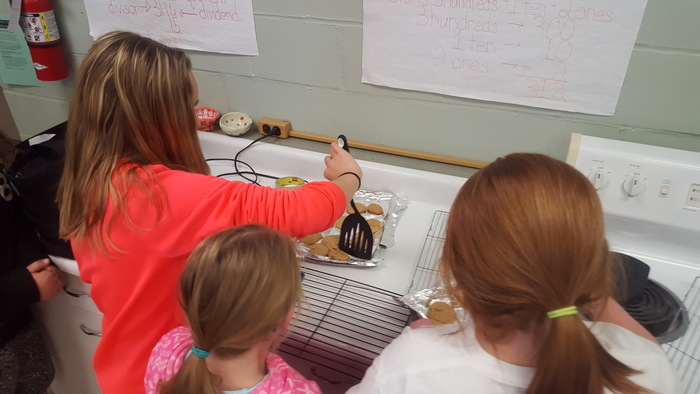 They enjoyed touring the museum, gaining inspiration for their spring Invention Convention. They also enjoyed interviewing veterans, as part of the Citizenship Unit. 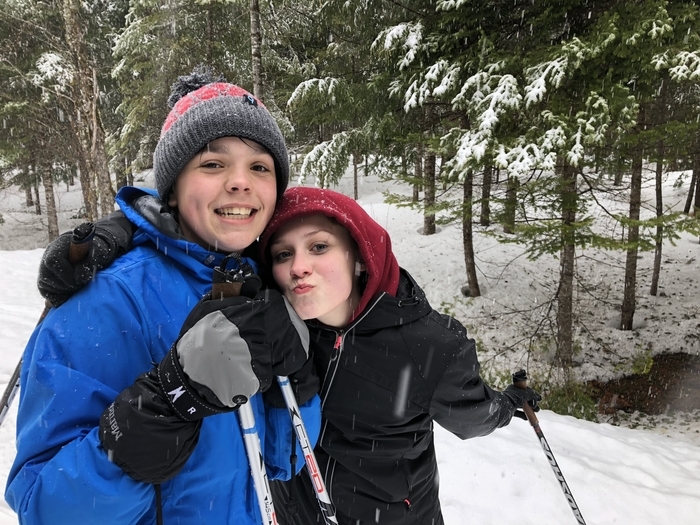 The 7th grade field trip for students in the Dickinson, Kenny, and Tuttle homerooms, originally scheduled for tomorrow, October 29th, has been cancelled due to weather. 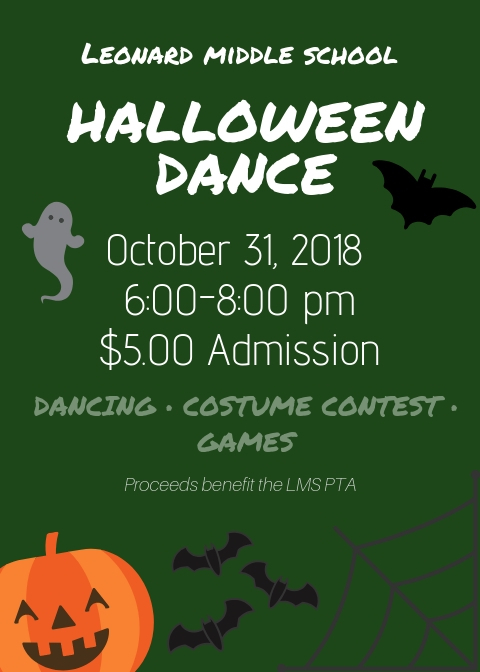 Thank you to our LMS PTA who will be hosting a Halloween Dance next Wednesday from 6-8pm in the LMS gymnasium as a healthy and safe option for kids. Tomorrow is mock election day at LMS! 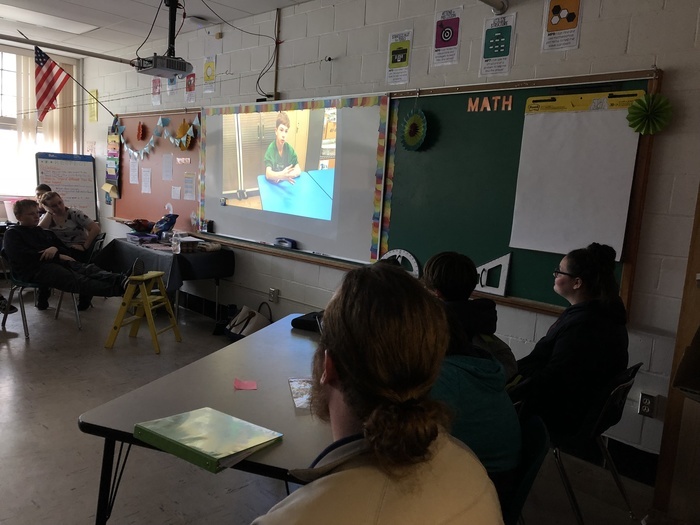 Our very own Danny Schlaefer is leading a school-wide effort to inform our young voters and help them cast their student votes! 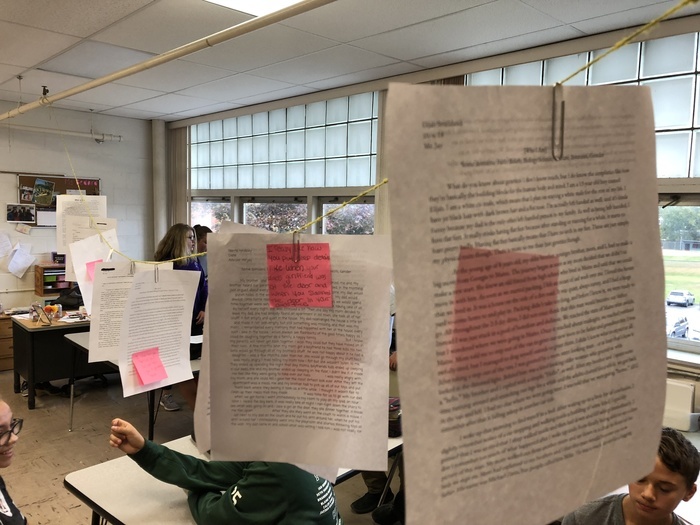 Last week, our 8th graders finished writing their personal narratives. 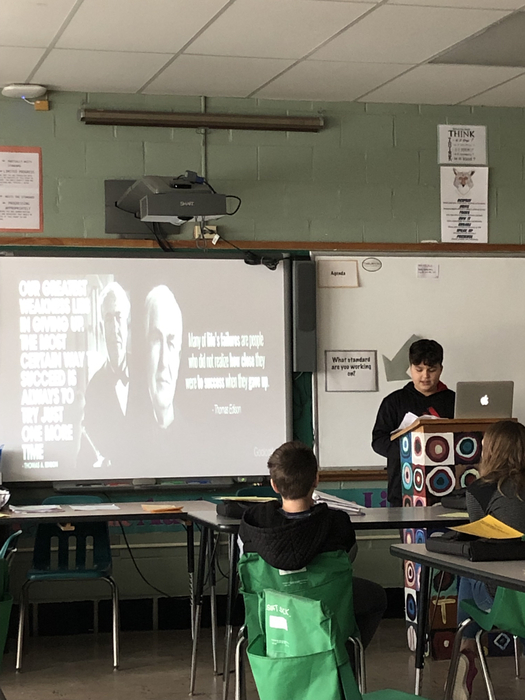 Some brave students chose to present to their peers. I really enjoyed listening to the stories, they were straight from the heart. The Scholastic Book Fair will be held this week at LMS! Students will have opportunities to visit the book fair throughout the week and every book purchased helps our school. Please contact Ms. Whedon, our Library/Media Specialist if you have any questions. 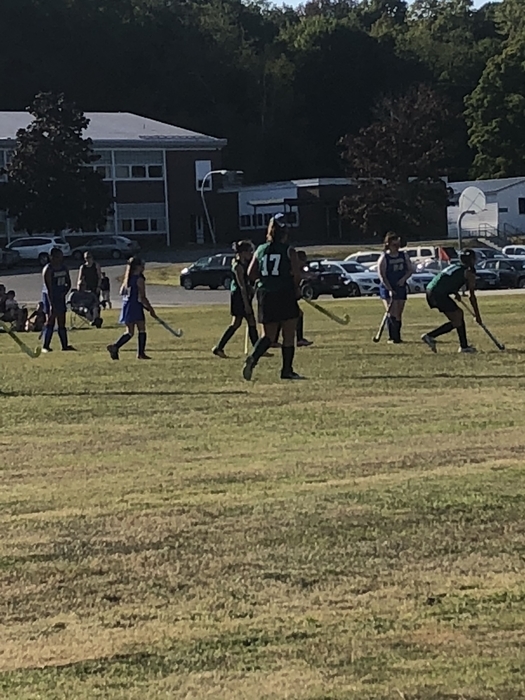 Congratulations to our LMS Field Hockey team who wrapped up their season with a 2-0 victory over Hermon. It was the 2nd season in a row the girl's pulled off an undefeated season. Coach Smith is very proud of the girl's work ethic and amazing attitude all season! Go Coyotes!!! 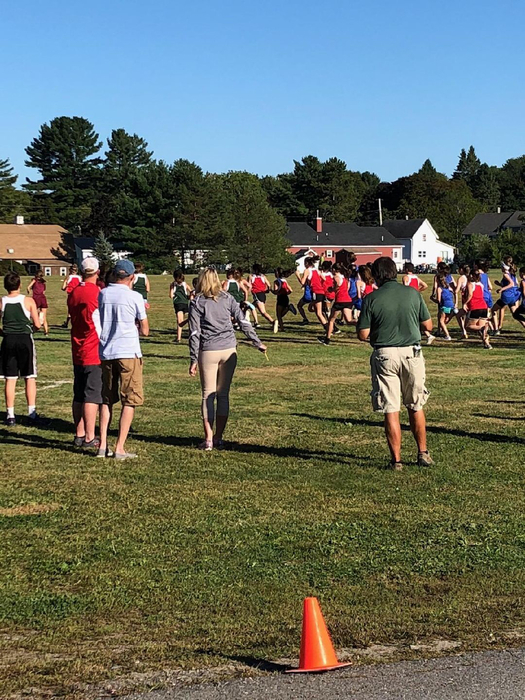 Congratulations to our boys and girls XC team who wrapped up the season Thursday at the Inlands Championship. The girls took 7th and the boys brought home a 3rd place trophy. Coach Dumont is so proud of both teams on all their hard work this season. 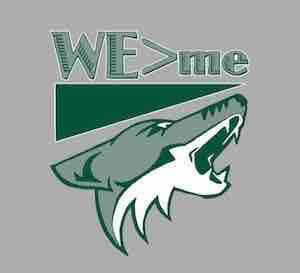 Go Coyotes!!! At the end of September, 6th graders met with Howard Jack from Jobcorps. Mr. Jack is helping build our Outdoor Learning Space behind our school garden. 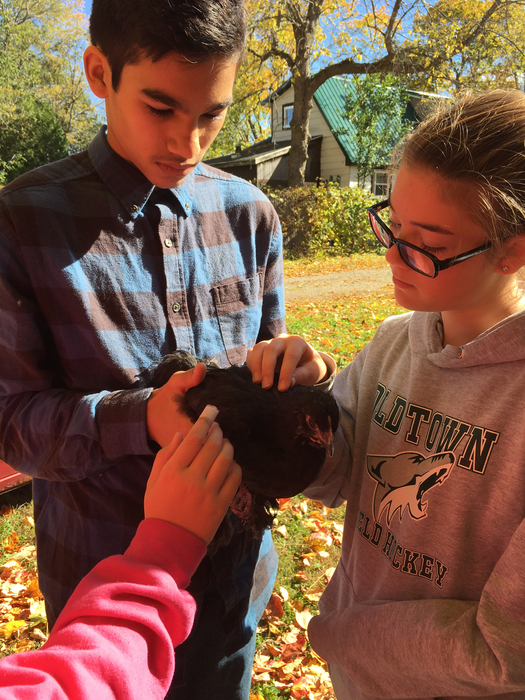 8th graders visited Nurse Koch’s chickens to extend their learning about genetics. 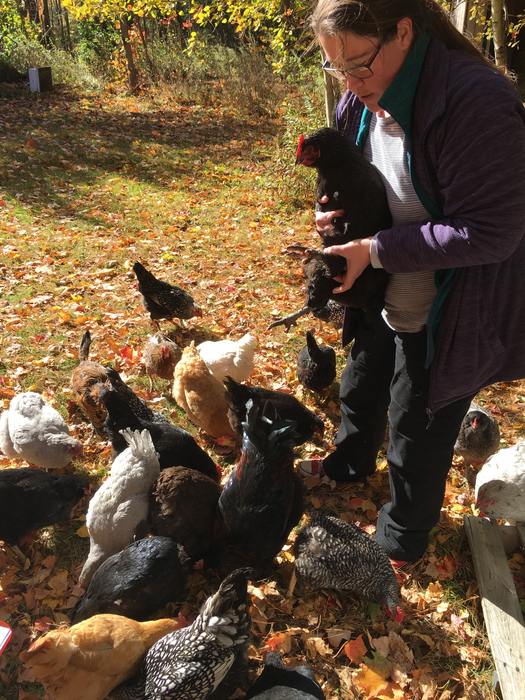 We are going to breed them in the spring to try to get certain egg and feather colors and personalities. Our LMS Robotics Club is back up and running thanks to Hogan Marquis! Practice started this week and the team worked hard to organize their gear and clean up the practice table. 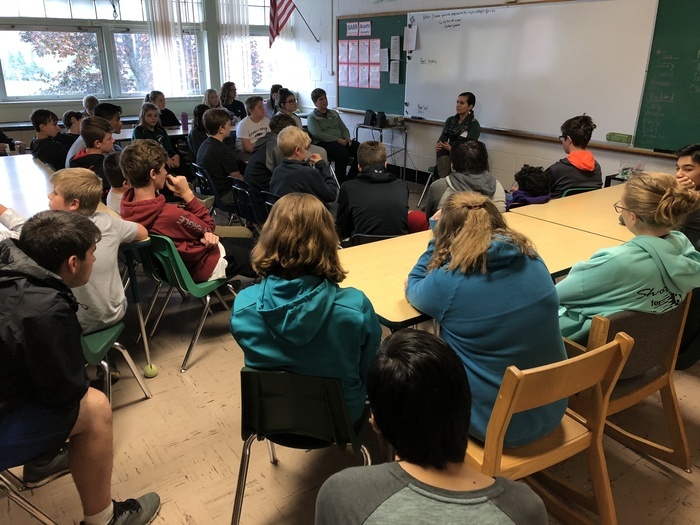 Maulian Dana, Ambassador for the Penobscot Nation, visited the 8th grade today. 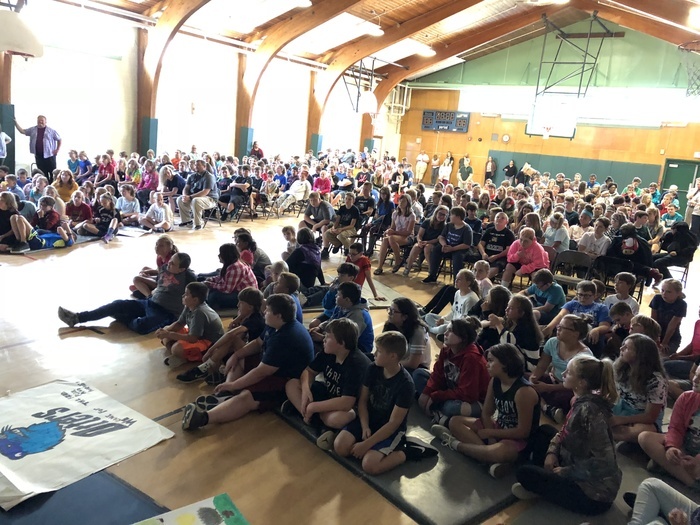 About 40 students chose to hear and discuss the movement to change Columbus Day to Indigenous Peoples Day. 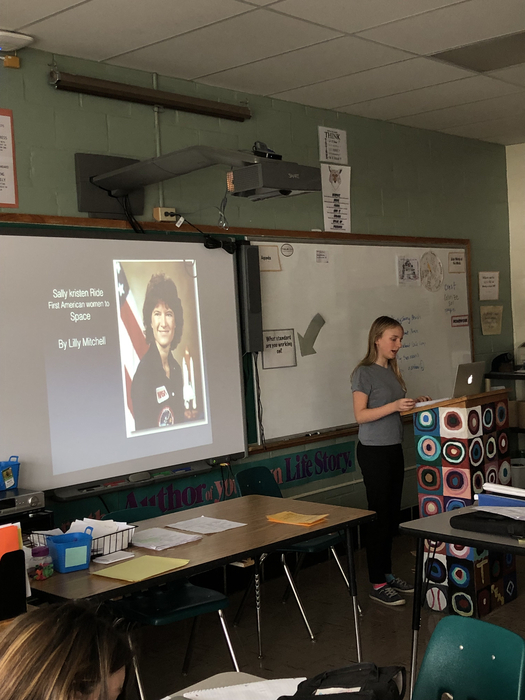 They also discussed mascots, stereotypes, and historical issues. Picture retakes will be on Monday, November 5th. 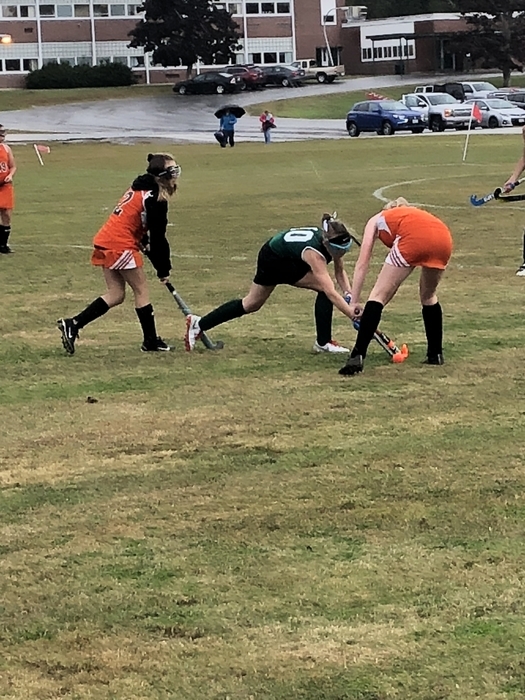 Today's field hockey game has been moved to 10/11, no practice today. For the game against Brewer tomorrow, the bus will leave at 5:30pm the 6:30pm game. Today's soccer games have been moved to 10/18, no practice today. Football and cross country practices are still scheduled for today. Happy Riverfest Old Town! I hope everyone enjoys the day of festivities. A shout out to our staff and students who are participating in the 5k and the parade this morning and also to our wonderful LMS-PTA volunteers! Be sure to visit their booth today to support their great work. In LMS athletic action on Monday our Football team played a tough Hermon team. Despite the loss, the injury plagued Coyotes played hard to the end. 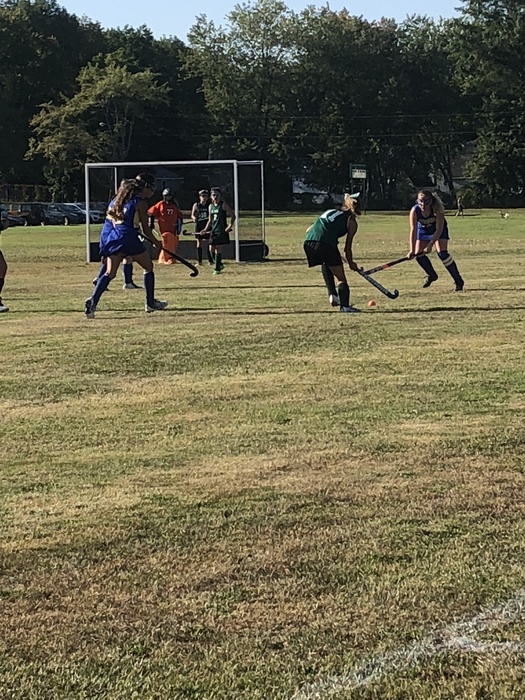 In Field Hockey news the ladies had two convincing wins over the Wagner school. Go Coyotes!!! 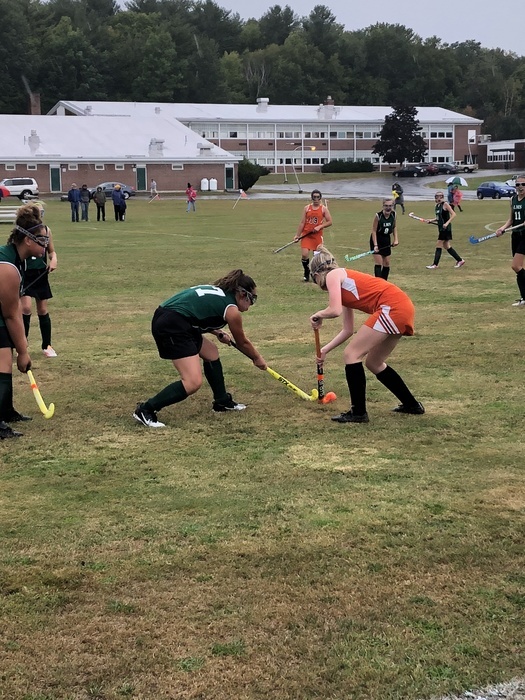 On Friday despite the wind and rain the LMS Field Hockey team played a very determined Brewer team and came away with a 1-0 victory. Well done ladies!!! 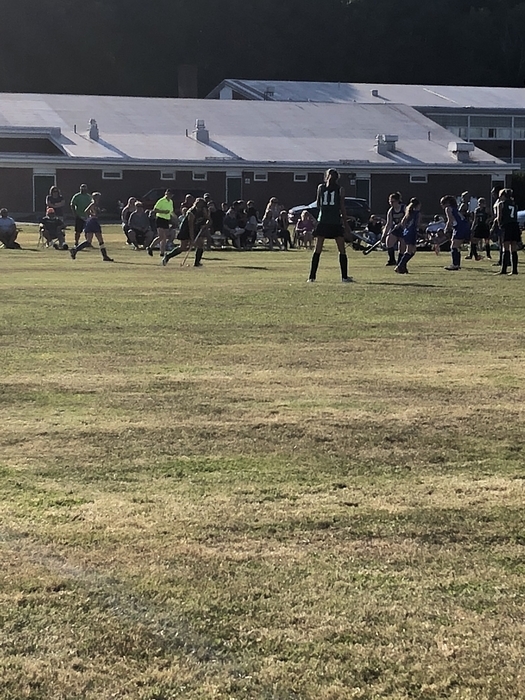 Thursday in LMS Athletics the girls and boys soccer teams played exciting games vs Ellsworth. Both teams took a loss but a lot of determination and great play was part of both games. 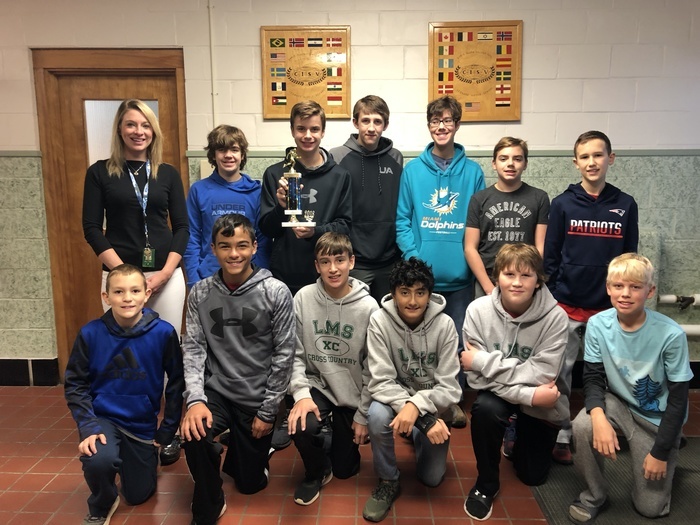 In XC news the LMS boys team took home the victory with the girl's placing 4th. Go Coyotes!!! Our 8th grade traveled to Camp Jordan today for a team building retreat. 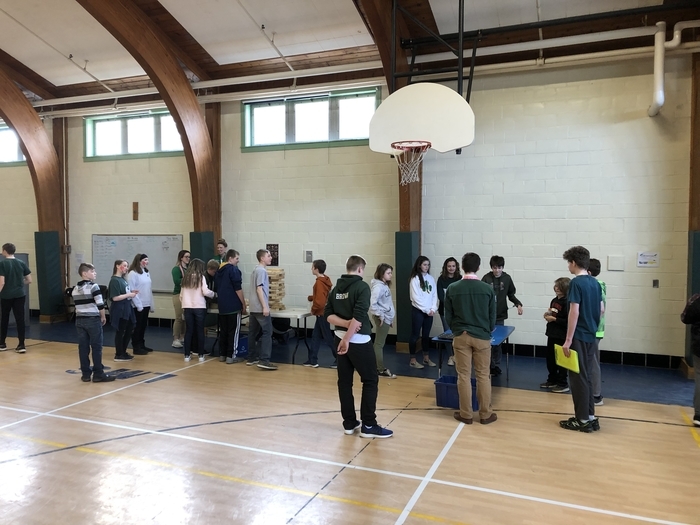 They participated in ropes course challenges and other group activities and all formed a stronger bond as a cohesive group of learners. RESPECT, FOCUS, DRIVE! 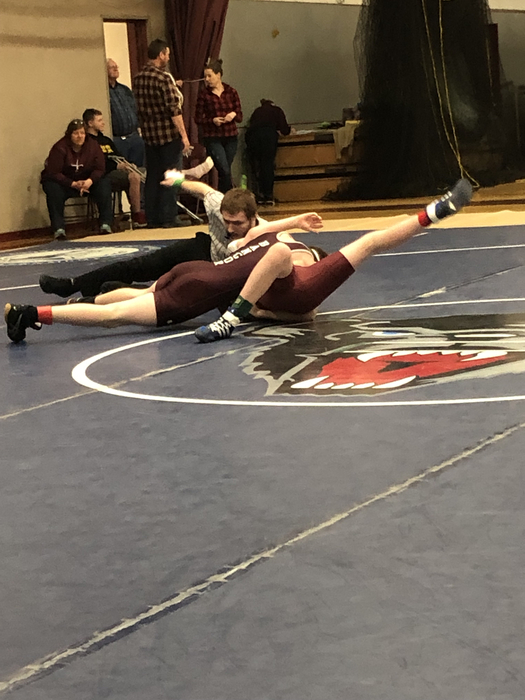 In Wednesday’s Athletic News our LMS football team fell to Ridgeview 12-6 in a well played contest. 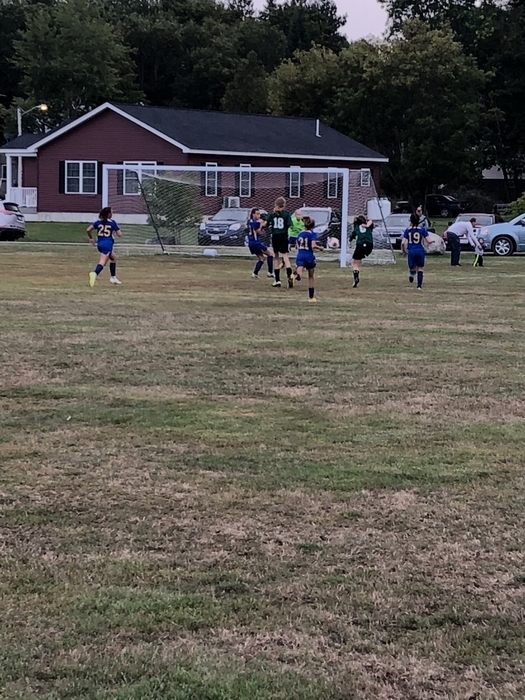 Against Hermon our girls soccer team came up short 2-1 in an exciting game. 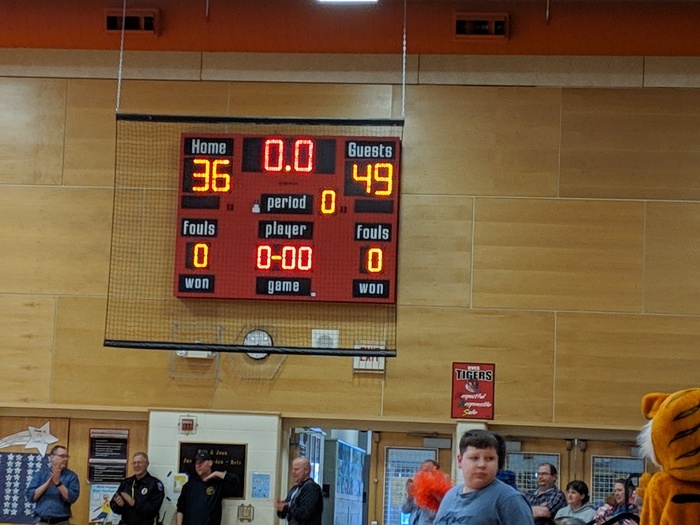 On the boys side Hermon outscored LMS 8-3, but we played hard to the final buzzer. Go Coyotes!!! Don’t forget to look your best tomorrow, LifeTouch will be at LMS all morning for school photos! Due to coach not feeling well there will be no FH practice today 9/18. 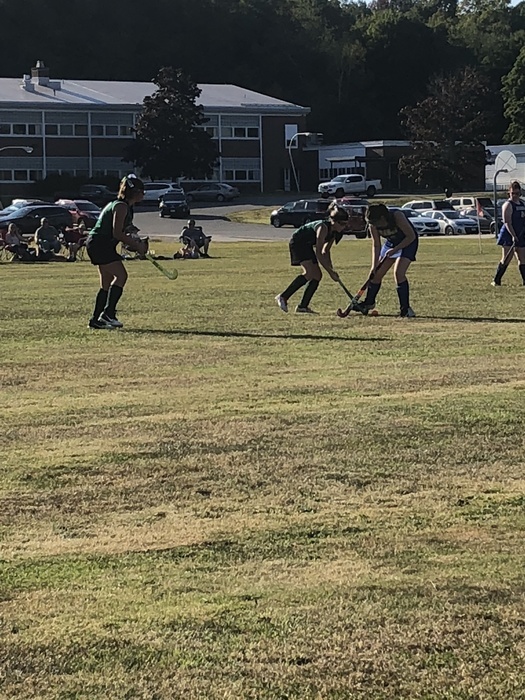 In Monday’s Athletic News both soccer teams had great games at Doughty, with the girls coming up short 4-3 and boys falling 2-1. Coaches were very pleased with the teams’ hard work! 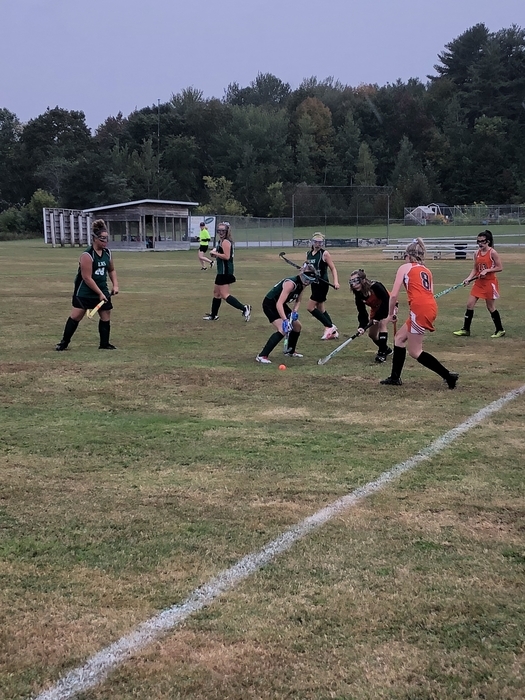 In field hockey the girls had a 5-1 victory over Doughty here at LMS. GO COYOTES!!! 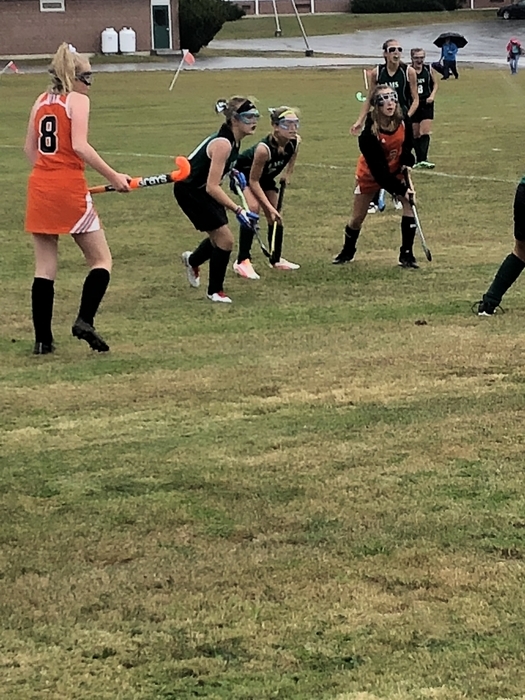 The LMS Field Hockey team got their season off to a great start Friday with a victory over Hermon. All the girls played hard on a beautiful hot afternoon. Go Coyotes!!! 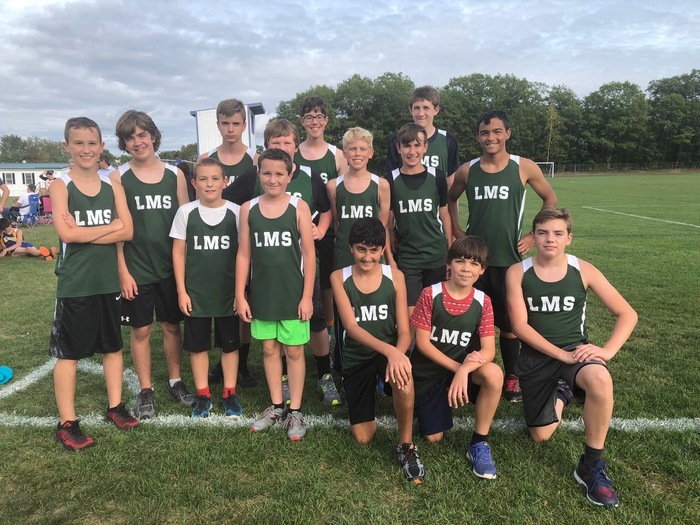 LMS XC got their season off to a great start yesterday with their one and only home XC meet. We are very proud of all of our runners and wish them luck the rest of the season. Go Coyotes!!! Join us at our Open House tonight from 6-7pm! The LMS PTA will be selling Krispy Kreme doughnuts so don’t forget to bring some money. 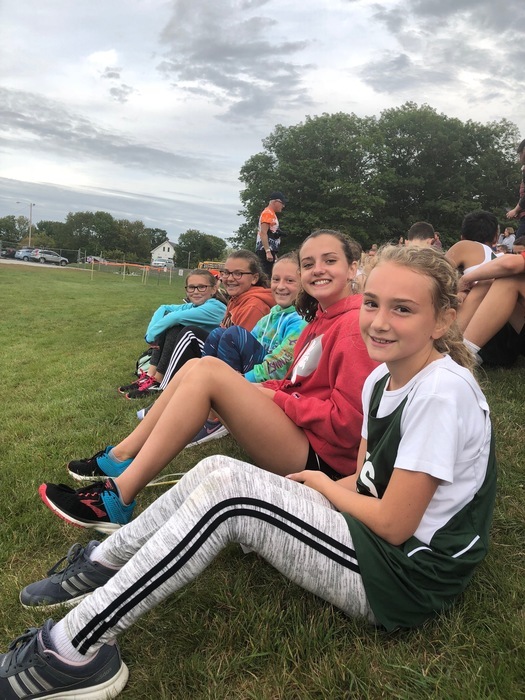 Looking forward to our only home Cross Country meet of the season this afternoon! Girl's race starts at 4:15 with the Boy's race to follow on the newly designed XC course. Go Coyote's! 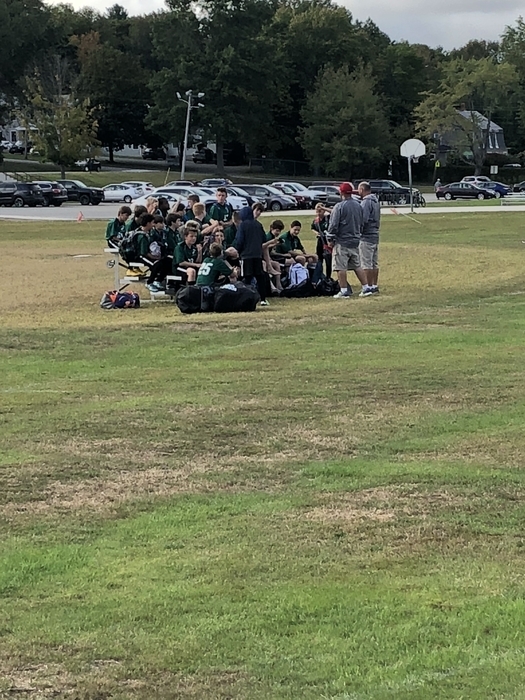 A great effort yesterday from our LMS football, girl's soccer and boy's soccer teams. 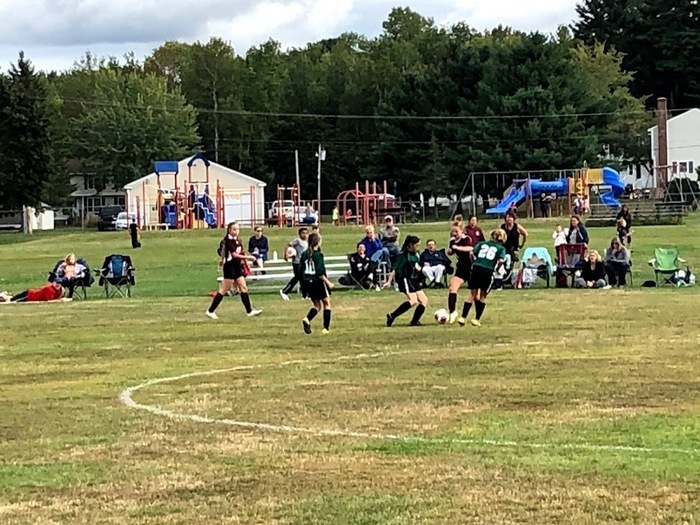 The soccer teams played hard with the girl's coming up short over Bucksport 1-0 and the boys pulled out a 6-4 victory. Football fought hard all 4 quarters to a tough Newport team. 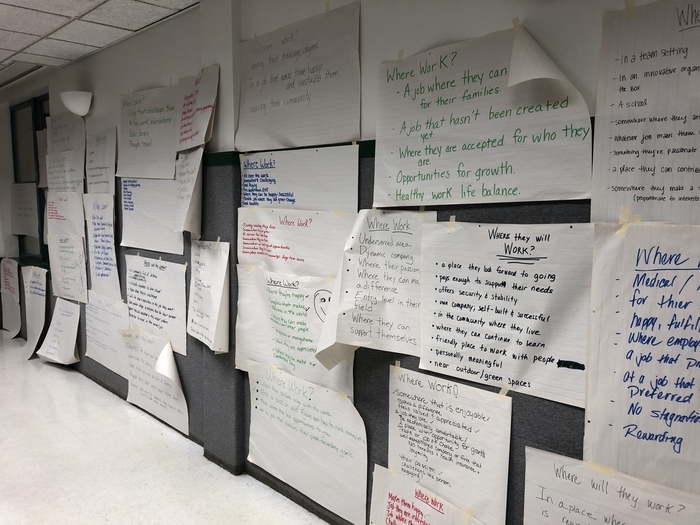 At our Community Building Summit last Friday, our students and staff showed off what it means to be a kind and respectful community of learners. 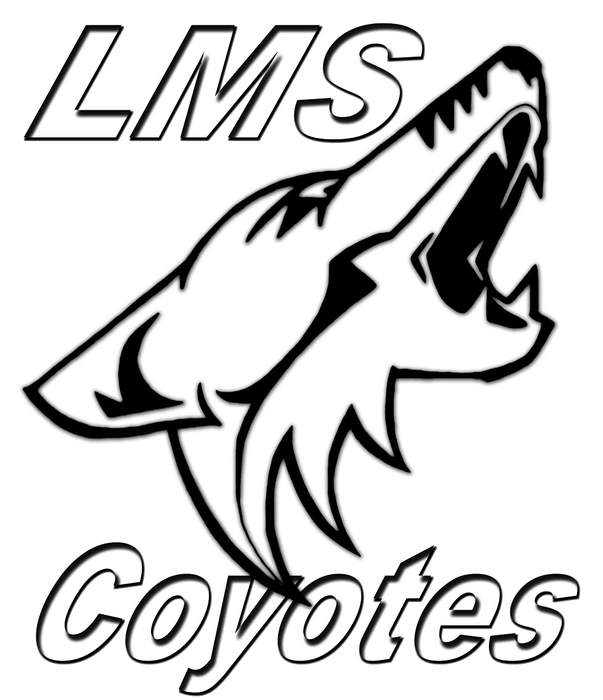 Welcome back to school LMS students! We can't wait to see all of our students on Tuesday, September 4th. Enjoy the long weekend and we'll see you soon! *Tryouts for Boys Soccer, Girls Soccer and Field Hockey will be W, TH, and Fri the first week of school. 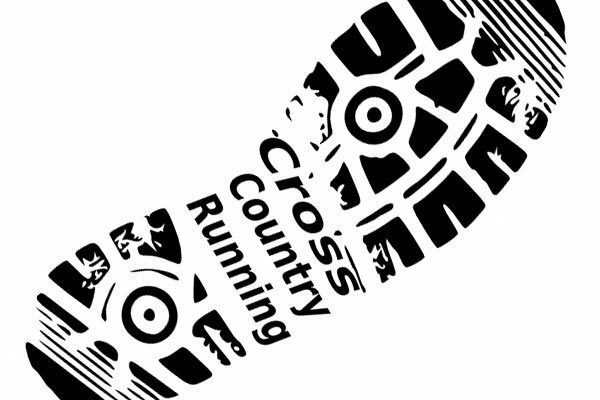 XC practice will start Weds. 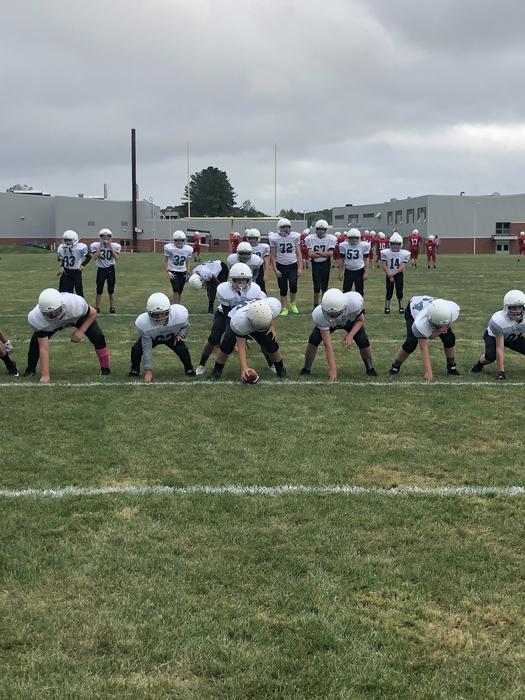 Regular Football practices all week with the first game on Weds at Bucksport. *All paperwork must be turned in before participating in one of these sports. *See Mr. Maxim during lunch if you have any questions.